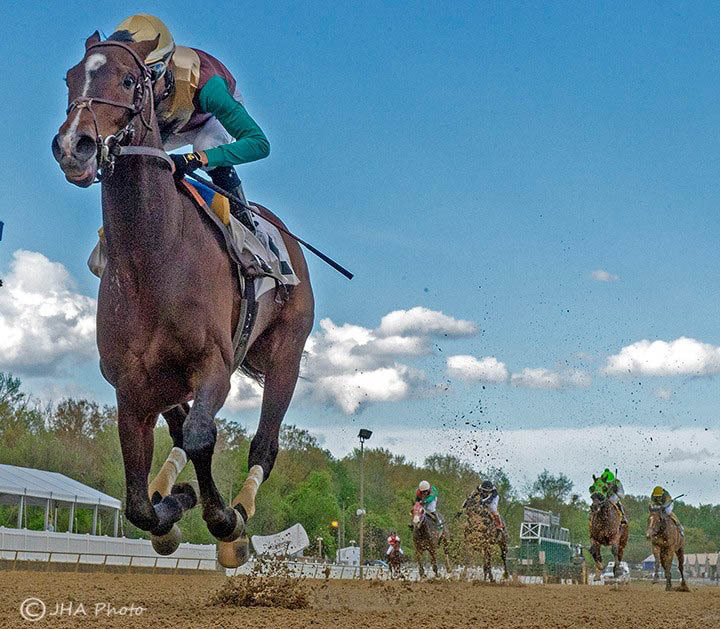 Alwaysmining leaves his competition in the dust as he comes to the wire in the Frederico Tesio Stakes Saturday at Laurel! Fair Hill had 44 starters last week. There were 5 wins, 6 places, 4 shows and earnings of $369,625; 34% of the starters finished first, second or third. Fair Hill had 23 starters last week. There were 4 wins, 7 places, 3 shows and earnings of $215,478; 61% of the starters finished first, second or third. Fair Hill had 26 starters last week. There were 6 wins, 4 places, 3 shows and earnings of $359,106; 50% of the starters finished first, second or third. 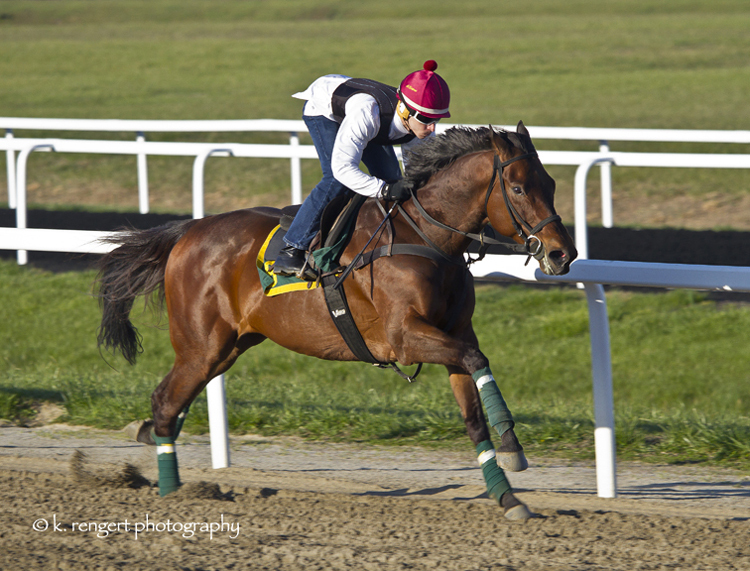 Global Access with Mel Williams aboard, looks happy getting his exercise on the Tapeta last week! Fair Hill had 15 starters last week. There were 4 wins, 2 places, 1 show and earnings of $149,961; 47% of the starters finished first, second or third. 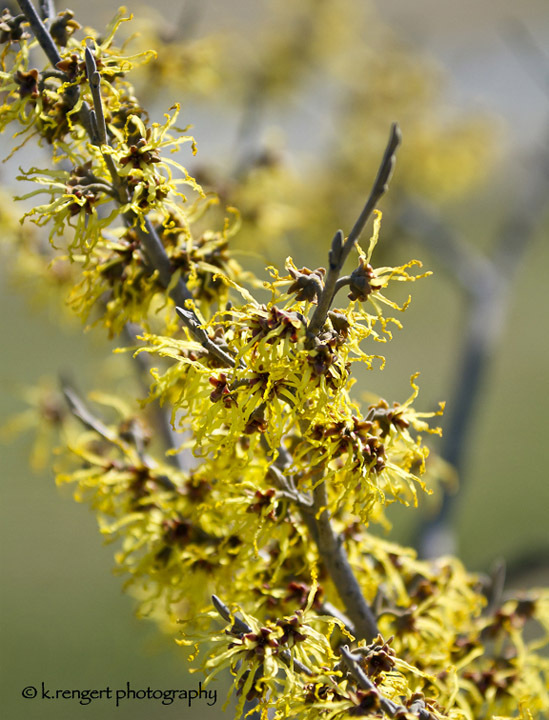 Signs of spring on the trees heading home from the track! Fair Hill had 21 starters last week. There were 4 wins, 4 places, 3 shows and earnings of $100,888; 52% of the starters finished first, second or third. Alwaysmining with Felix Astudillo up, taking advantage of a good dirt track before his fourth consecutive stakes win Saturday! There were 2 wins, 4 places, 1 show and earnings of $126,060; 30% of the starters finished first, second or third. 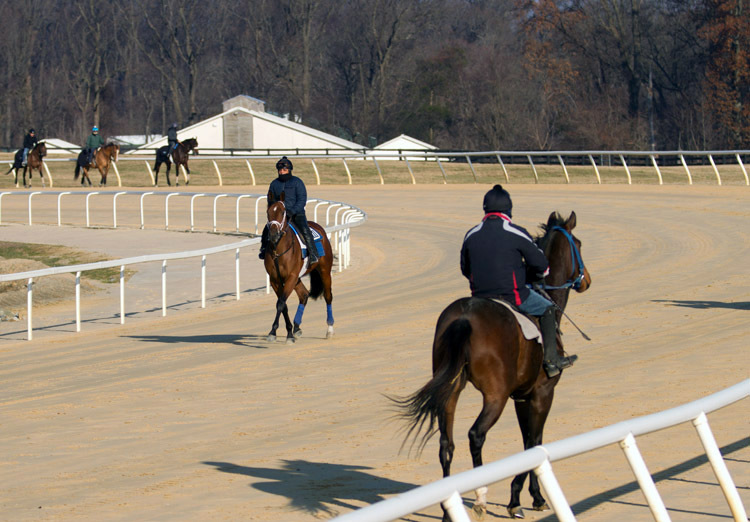 Horses training out of the Tapeta gate during the dirt break! Fair Hill had 14 starters last week. There were 4 wins, 1 place, 1 show and earnings of $82,732; 43% of the starters finished first, second or third. 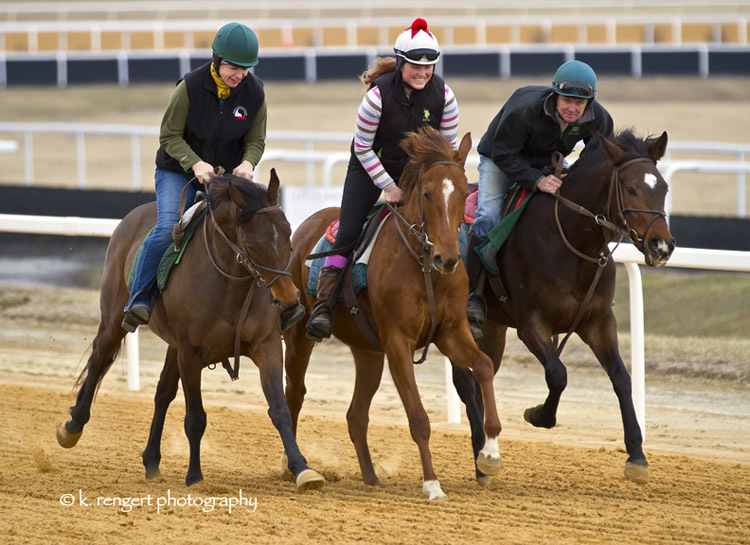 Horses taking advantage last Thursday of the first fast dirt track in a long time at FHTC! Fair Hill had 33 starters last week. There were 4 wins, 7 places, 7 shows and earnings of $164,389; 55% of the starters finished first, second or third. 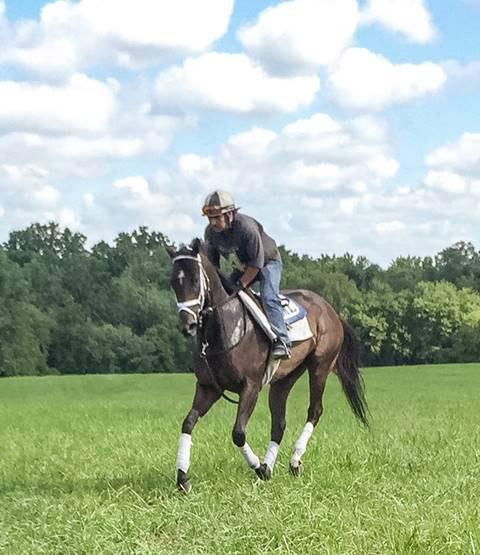 Bowman's Beast with Santiago Palacious aboard, enjoying life as a ten-year-old at FHTC prior to his win last Tuesday! Fair Hill had 24 starters last week. There were 5 wins, 4 places, 1 show and earnings of $165,360; 42% of the starters finished first, second or third. Alwaysmining with Felix Astudillo aboard breezing prior to keeping his win streak alive in the Miracle Wood Stakes Saturday! 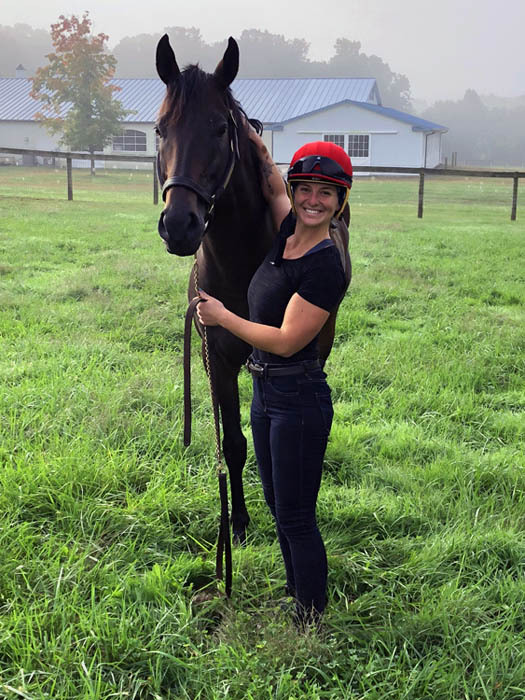 Fair Hill had 10 starters last week. 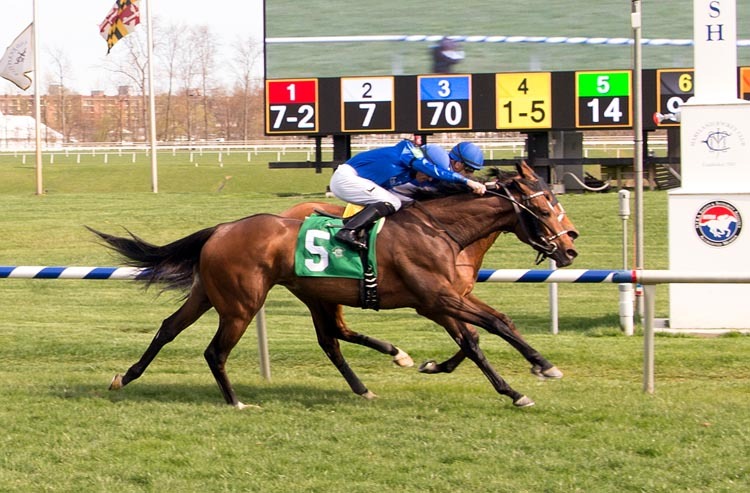 There were 3 wins, 2 places and earnings of $137,394; 50% of the starters finished first, second or third. There were 2 wins, 5 places, 4 shows and earnings of $107,107; 48% of the starters finished first, second or third. 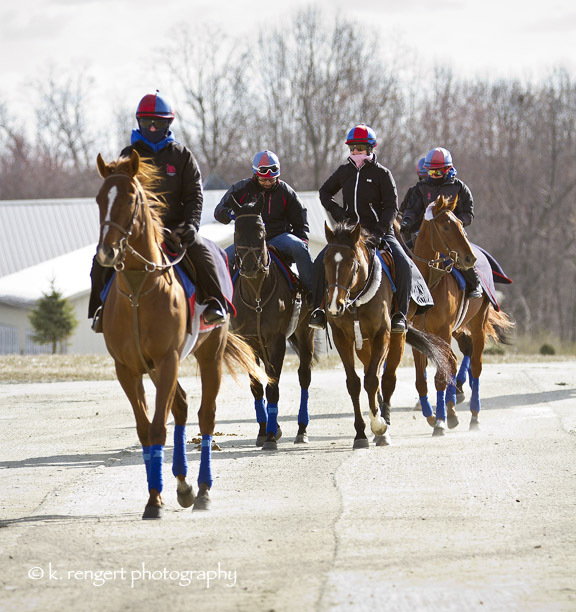 Horses heading to the Tapeta for training, braving the frigid air on Saturday! Fair Hill had 16 starters last week. There were 1 win, 4 places, 2 shows and earnings of $80,265; 44% of the starters finished first, second or third. 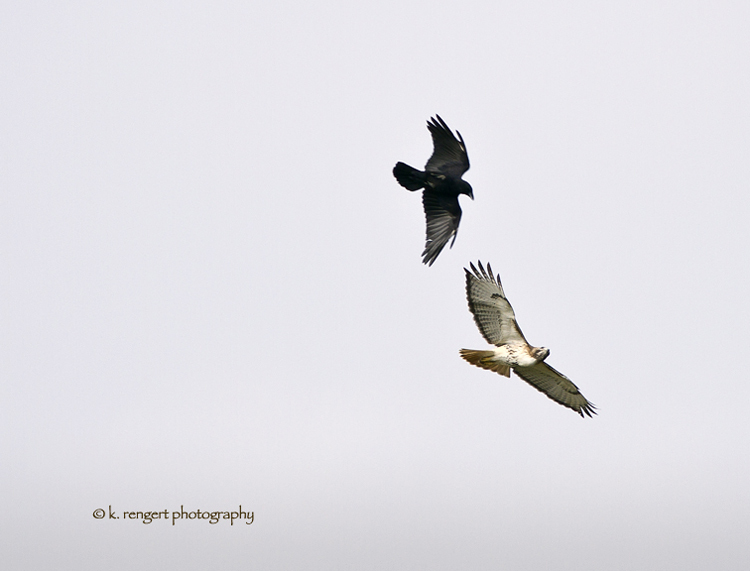 Youngster learning a thing or two training alongside an older horse! Fair Hill had 9 starters last week. There was 1 win, 1 place, 1 show and earnings of $29,780; 33% of the starters finished first, second or third. 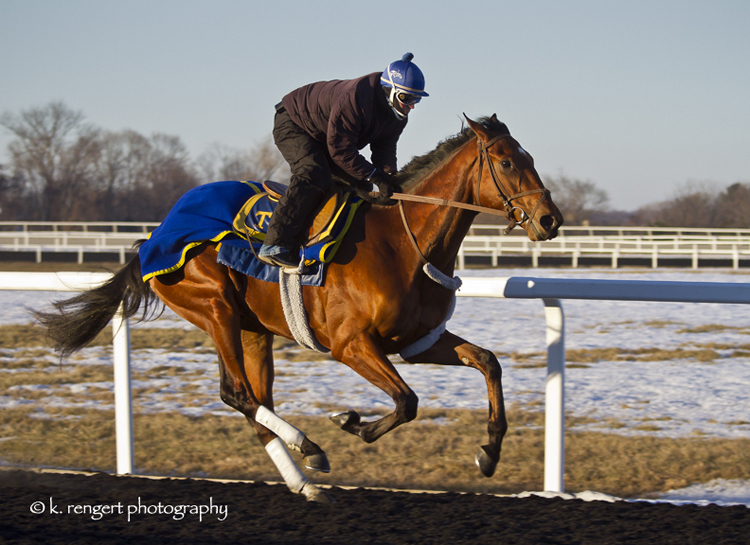 Win Win Win, with Mel Williams aboard, galloping on the Tapeta on a frosty morning! Fair Hill had 31 starters last week. There were 3 wins, 6 places, 5 shows and earnings of $183,949; 45% of the starters finished first, second or third. 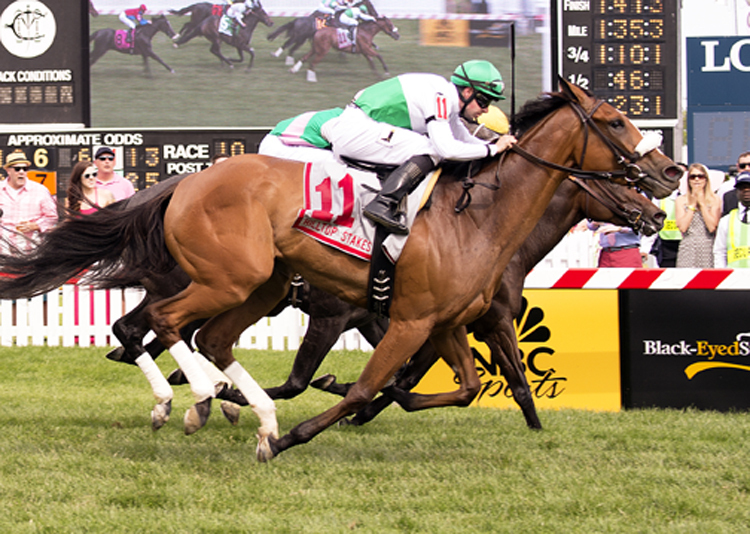 General Downs winning the Native Dancer in his first stakes attempt! 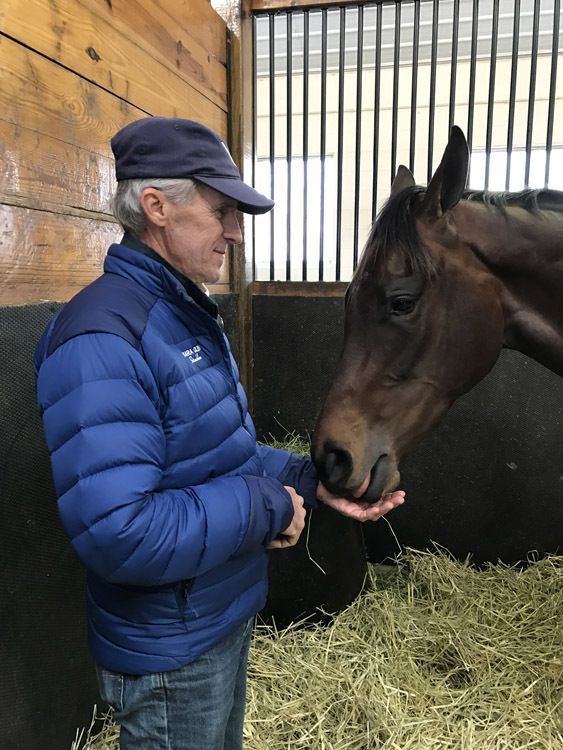 Fair Hill had 20 starters last week. There were 5 wins, 3 places, 4 shows and earnings of $195,989; 60% of the starters finished first, second or third. Casual conversation going to and from the track! There were 9 wins, 8 places, 8 shows and earnings of $254,797; 76% of the starters finished first, second or third. 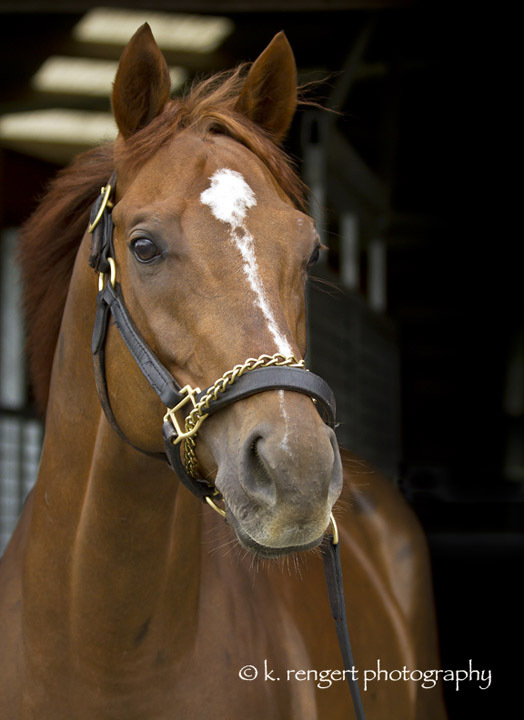 Alwaysmining back in his stall at Fair Hill after his third straight win in the Heft Stakes! There were 2 wins, 6 places, 2 shows and earnings of $135,395; 42% of the starters finished first, second or third. 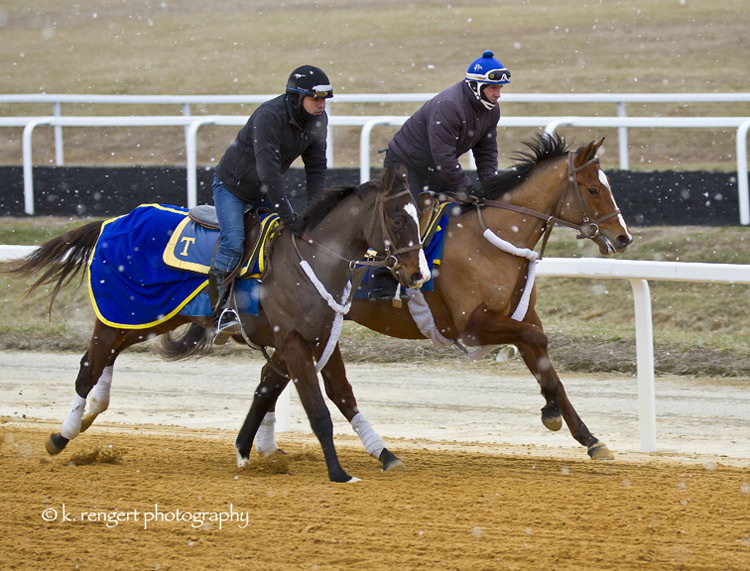 Horses going to and from the Tapeta via the frozen dirt track! There were 2 wins, 4 places, 1 show and earnings of $103,009; 47% of the starters finished first, second or third. 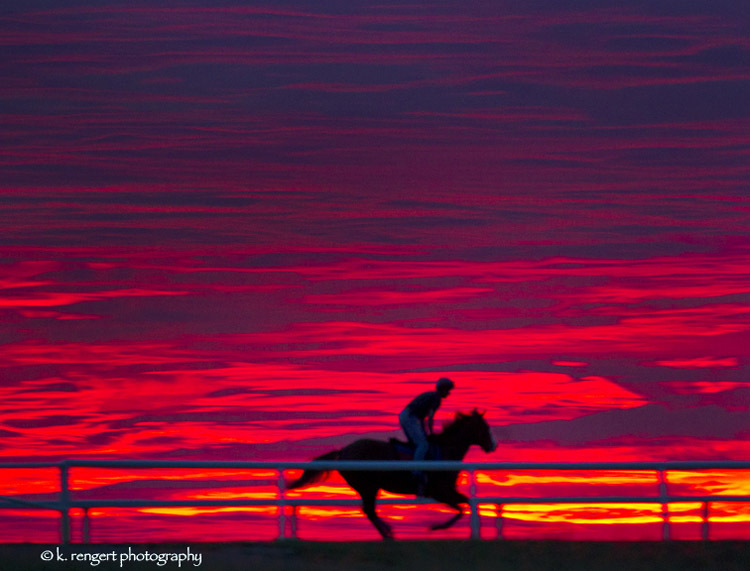 Glorious Empire (IRE) with Selvin Hernandez aboard, floating over the Tapeta prior to his Grade II win at Gulfstream! Fair Hill had 29 starters last week. There were 7 wins, 4 places, 3 shows and earnings of $307,230; 48% of the starters finished first, second or third. A cold week at FHTC! There were 7 wins, 4 places, 3 shows and earnings of $236,063; 42% of the starters finished first, second or third. 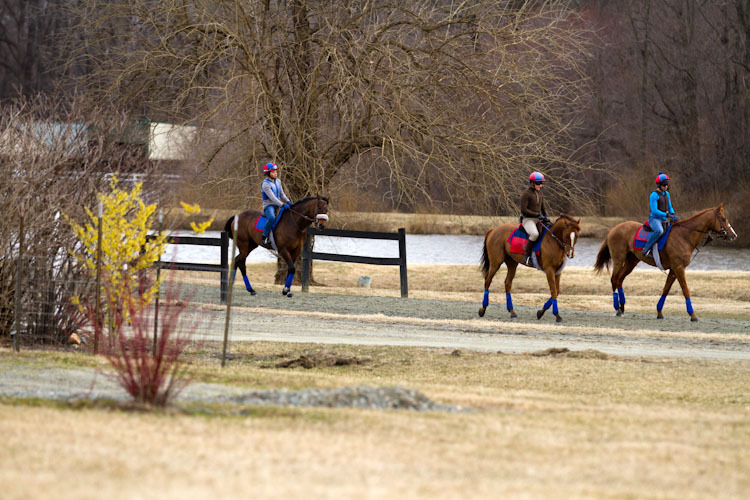 Horses heading back to the barn after training! There were 5 wins, 2 places, 4 shows and earnings of $150,733; 38% of the starters finished first, second or third. Five Star General training over the Tapeta prior to winning in his first stakes race start! Fair Hill had 47 starters last week. There were 10 wins, 7 places, 1 show and earnings of $448,620; 38% of the starters finished first, second or third. 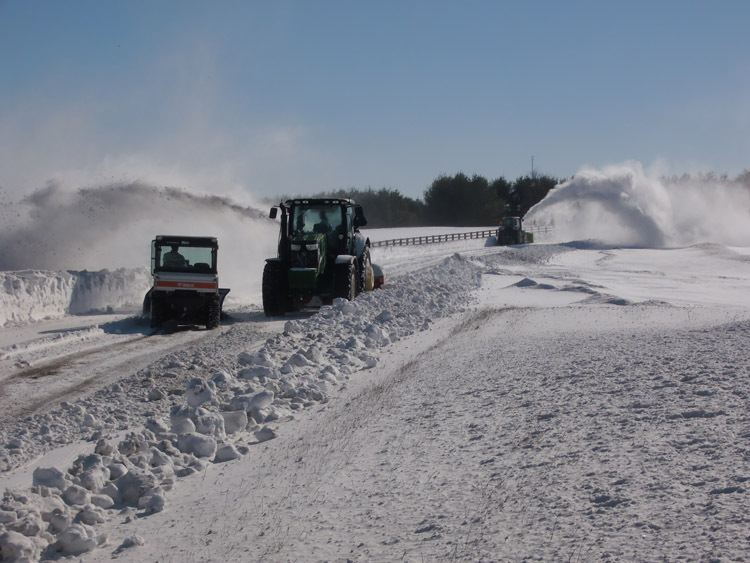 Our first winter storm last Thursday during training! There were 4 wins, 3 places, 4 shows and earnings of $145,358; 38% of the starters finished first, second or third. A busy day gate schooling at FHTC last week! There were 6 wins, 4 places, 10 shows and earnings of $228,773; 45% of the starters finished first, second or third. 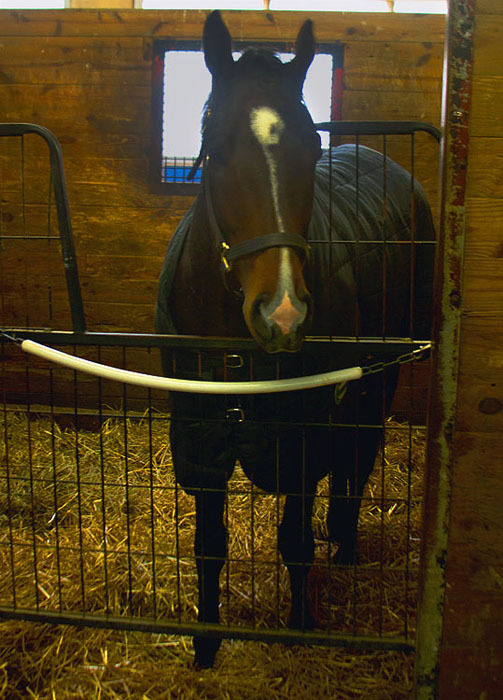 No Dozing back relaxing in his stall at FHTC after his first graded stakes victory Friday! Fair Hill had 53 starters last week. There were 10 wins, 7 places, 8 shows and earnings of $778,677; 47% of the starters finished first, second or third. 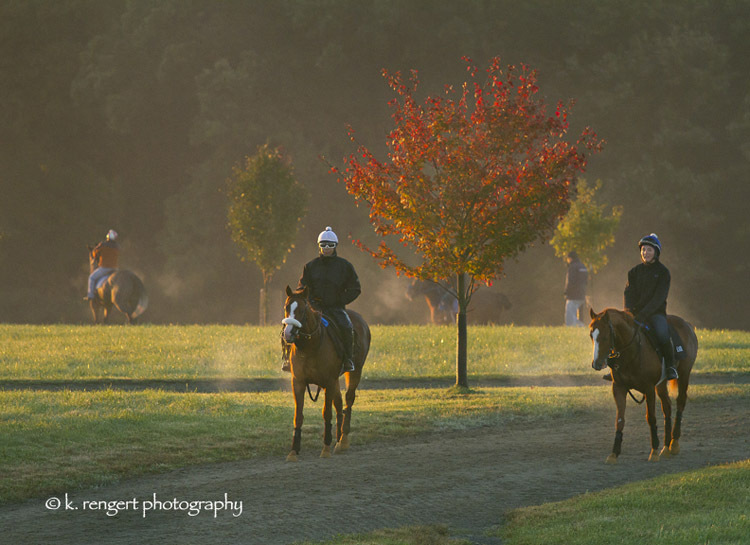 The leaves are finally starting to change color as horses head to the track last week! Fair Hill had 55 starters last week. There were 8 wins, 14 places, 7 shows and earnings of $447,752; 53% of the starters finished first, second or third. 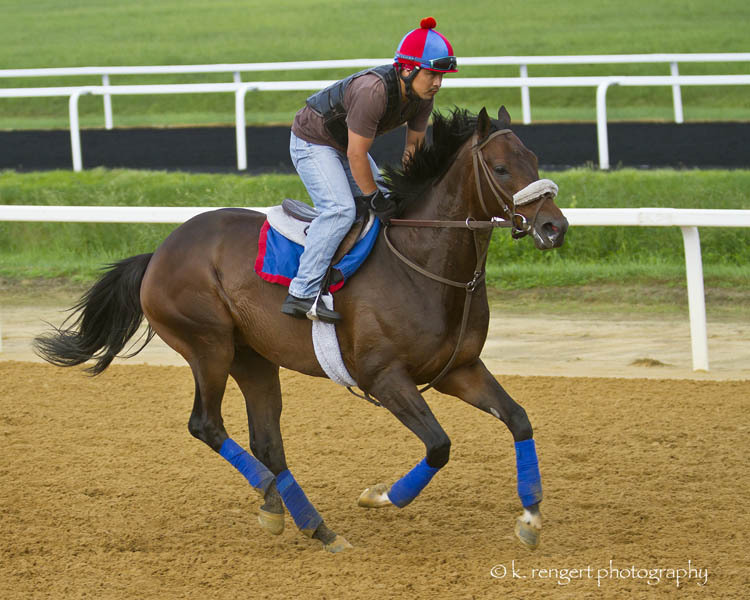 Fair Hill had 77 starters last week. There were 9 wins, 12 places, 7 shows and earnings of $552,030; 36% of the starters finished first, second or third. Youngsters training over another wet track last week at FHTC! 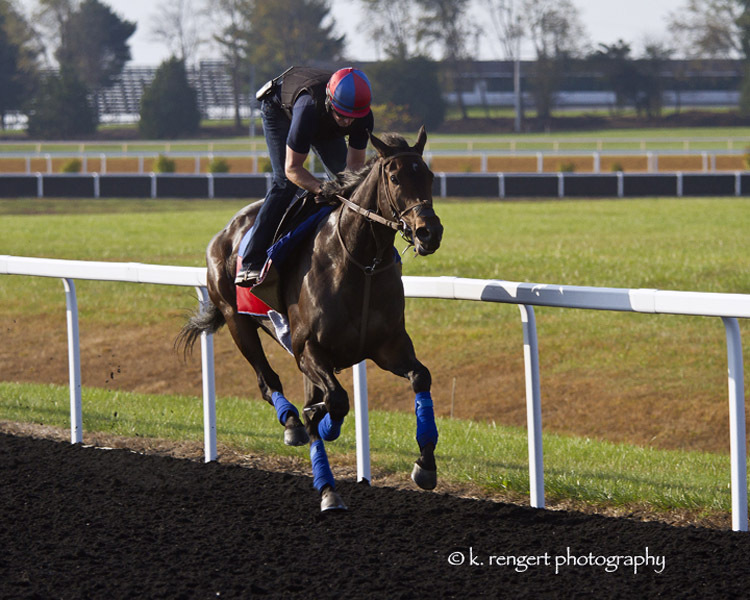 Fair Hill had 56 starters last week. There were 2 wins, 15 places, 5 shows and earnings of $305,238; 39% of the starters finished first, second or third. 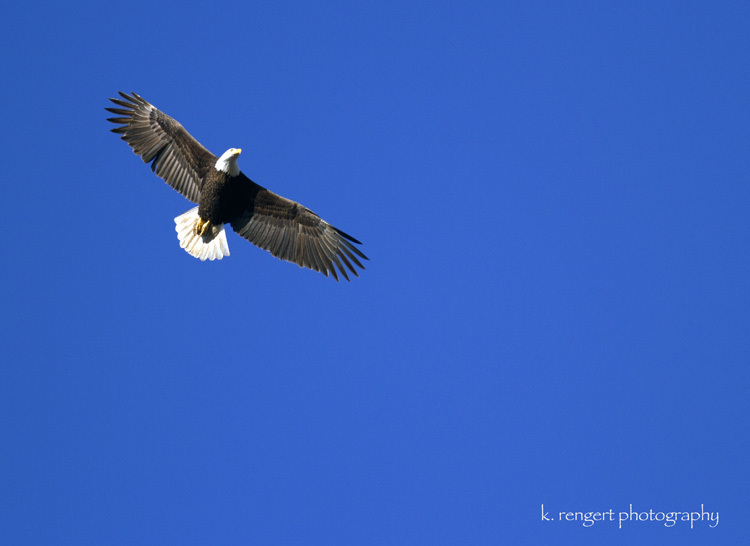 When life forces you to look down, soar up! Fair Hill had 86 starters last week. There were 15 wins, 12 places, 13 shows and earnings of $616,128; 47% of the starters finished first, second or third. 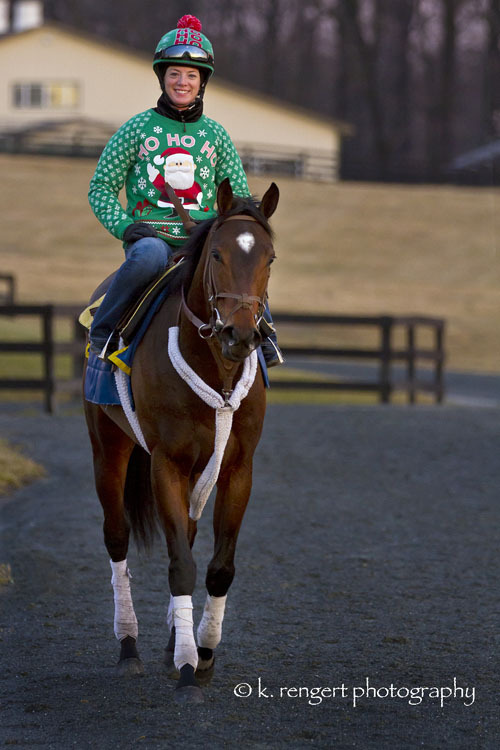 Doctor Mounty, with exercise rider Molly Connell, out for a graze after his Grade III stakes win at Laurel on Saturday! Fair Hill had 52 starters last week. There were 6 wins, 12 places, 8 shows and earnings of $464,730; 50% of the starters finished first, second or third. There were 12 wins, 12 places, 15 shows and earnings of $688,944; 51% of the starters finished first, second or third. Fair Hill had 48 starters last week. There were 6 wins, 9 places, 6 shows and earnings of $564,210; 44% of the starters finished first, second or third. 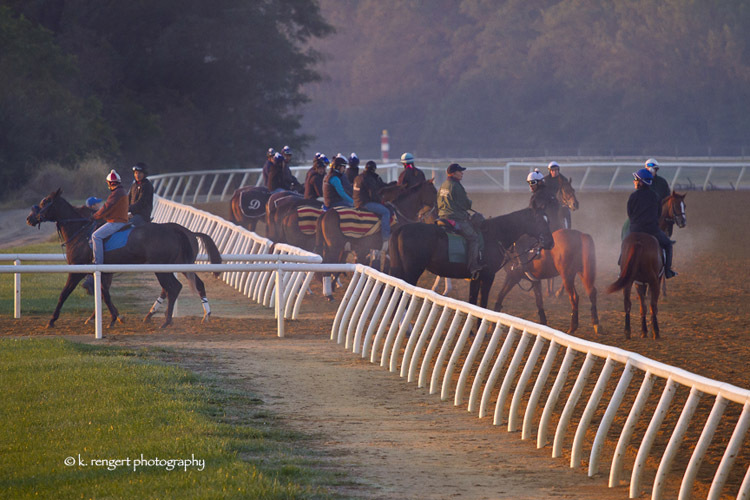 Fair Hill had 70 starters last week. There were 13 wins, 16 places, 9 shows and earnings of $881,945; 54% of the starters finished first, second or third. 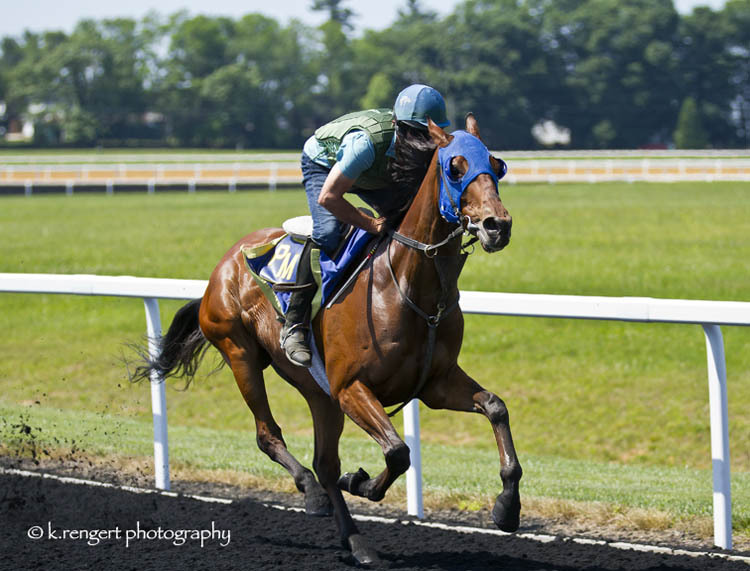 Synchrony, with Brian Pedroza aboard, skipping over the Tapeta prior to his Grade III win at Monmouth Park! Fair Hill had 71 starters last week. There were 17 wins, 7 places, 11 shows and earnings of $653,277; 49% of the starters finished first, second or third. 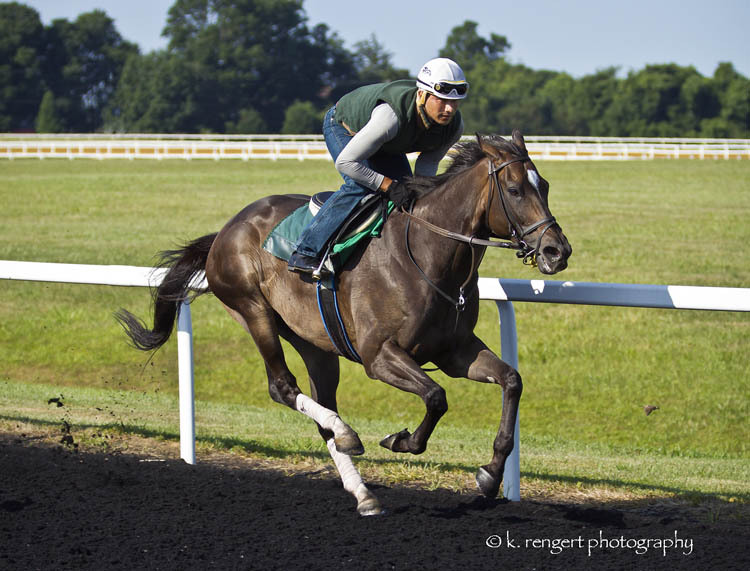 Glorious Empire (IRE), Selvin Hernandez aboard, in his final tune-up prior to his Sword Dancer win at Saratoga! Fair Hill had 39 starters last week. There were 9 wins, 3 places, 3 shows and earnings of $751,057; 38% of the starters finished first, second or third. 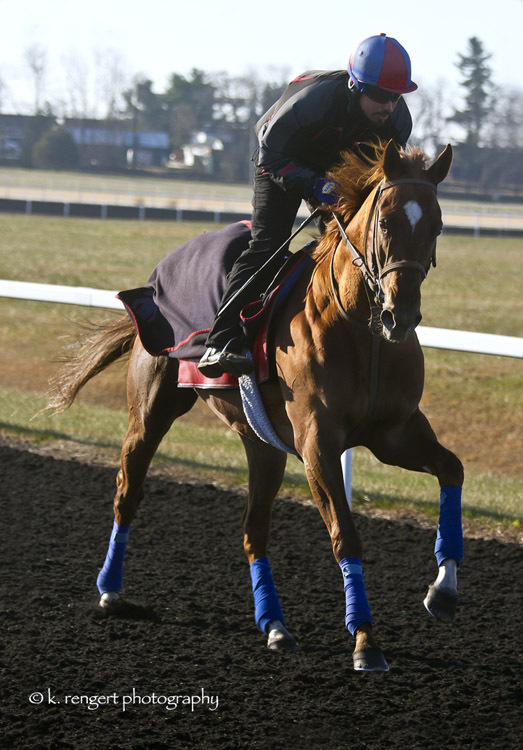 Utmost (outside), with Robbie Walsh aboard, gliding over the Tapeta prior to his Grade II Sky Classic win on Sunday! Fair Hill had 76 starters last week. There were 9 wins, 12 places, 16 shows and earnings of $648,244; 49% of the starters finished first, second or third. 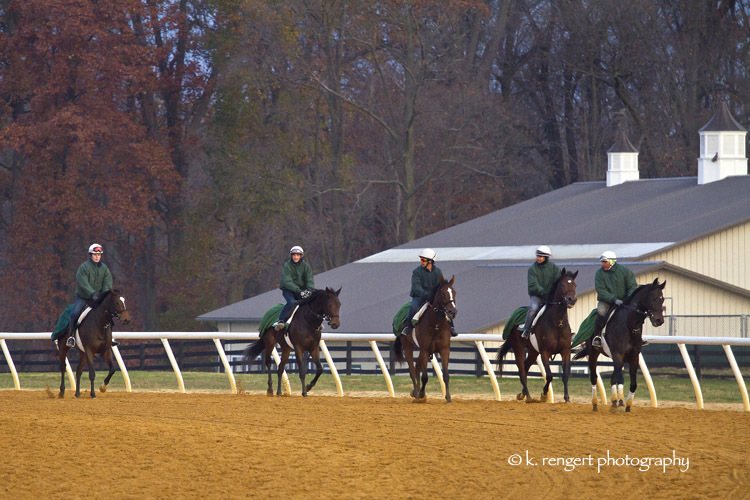 Fair Hill had 74 starters last week. There were 12 wins, 10 places, 13 shows and earnings of $546,569; 47% of the starters finished first, second or third. 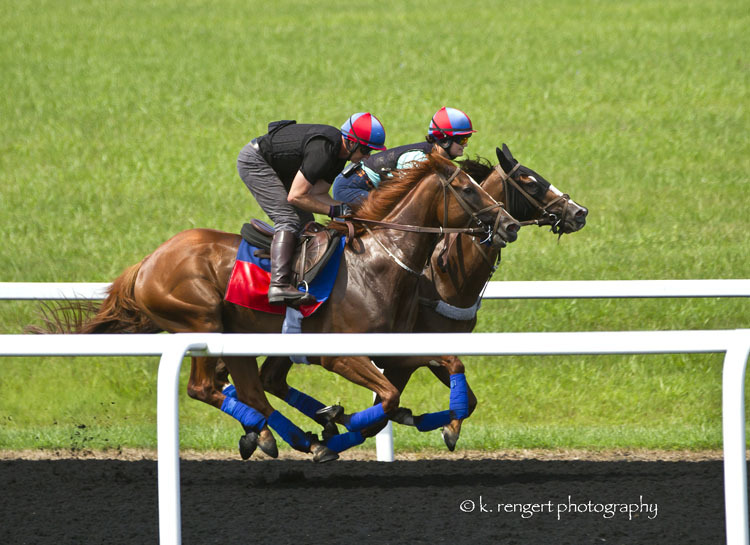 Mythical Mission (inside), with Mary Motion aboard, breezing prior to winning her first stake on Saturday! 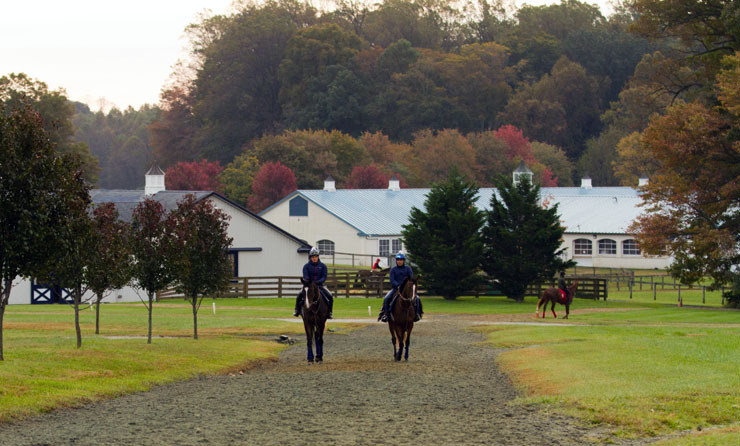 Fair Hill had 54 starters last week. There were 7 wins, 10 places, 10 shows and earnings of $425,049; 50% of the starters finished first, second or third. Glorious Empire (IRE), Selvin Hernandez aboard, skipping across the Tapeta prior to his Bowling Green Stakes win at Saratoga! There were 9 wins, 10 places, 6 shows and earnings of $521,817; 45% of the starters finished first, second or third. 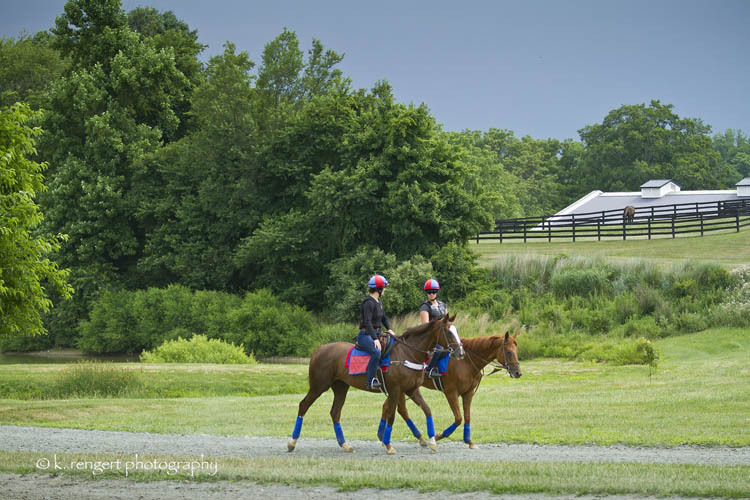 Fair Hill had 64 starters last week. There were 8 wins, 10 places, 10 shows and earnings of $501,191; 44% of the starters finished first, second or third. 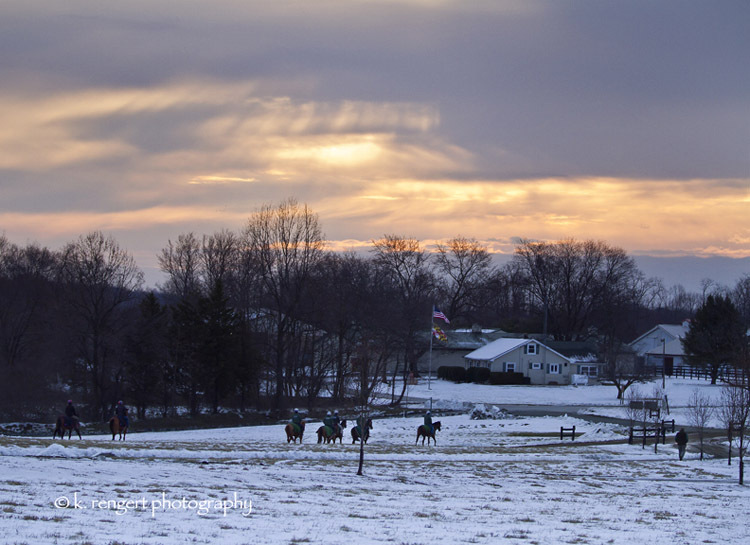 The last set of horses heading back to their barn after training Sunday morning as the storm started rolling in! Fair Hill had 82 starters last week. There were 9 wins, 17 places, 9 shows and earnings of $375,817; 43% of the starters finished first, second or third. 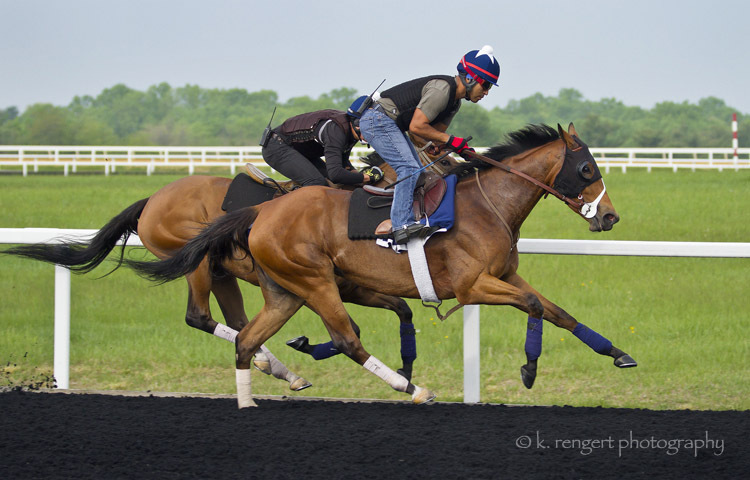 Divisidero with Jevian Toledo aboard, breezing over the Tapeta! Fair Hill had 65 starters last week. There were 9 wins, 11 places, 16 show and earnings of $755,852; 55% of the starters finished first, second or third. Three two year olds learning the ropes at FHTC on Saturday! Fair Hill had 61 starters last week. There were 7 wins, 10 places, 9 show and earnings of $417,526; 43% of the starters finished first, second or third. 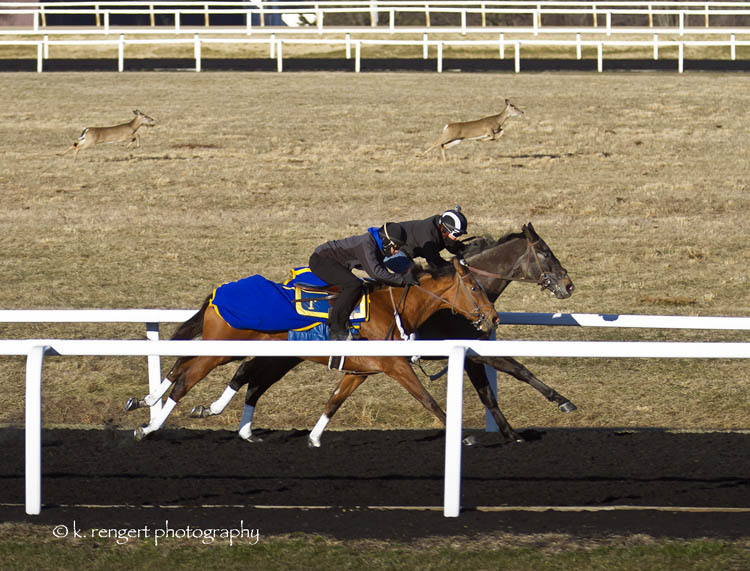 Shahroze(IRE) with Pedro Tranquilino aboard, having an easy gallop leading up to his first Stakes win at Woodbine Saturday! 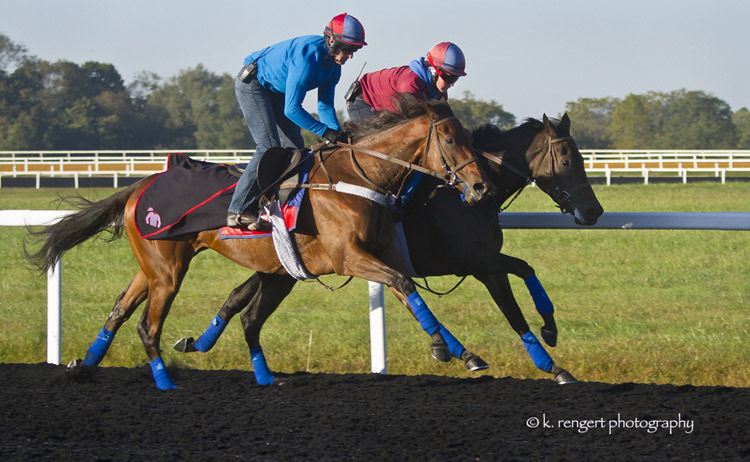 Fair Hill had 60 starters last week. There were 8 wins, 14 places, 9 show and earnings of $459,537; 52% of the starters finished first, second or third. 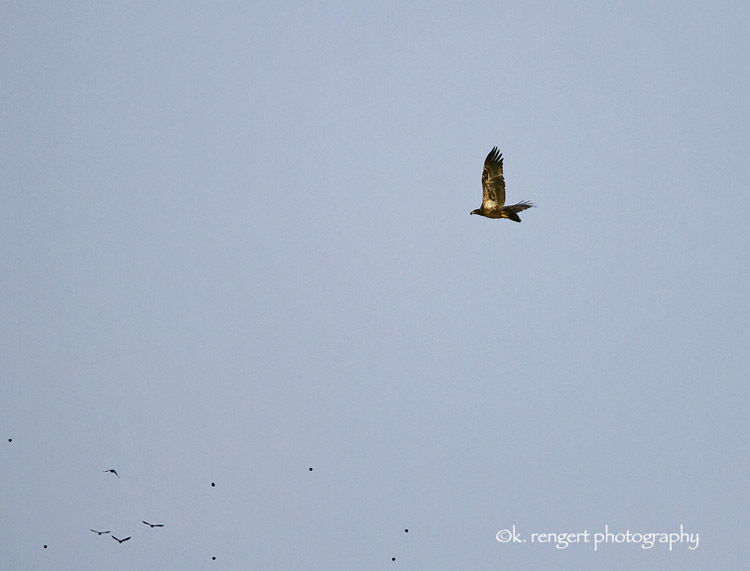 Chalon, with Chino aboard, flying over the Tapeta prior to winning the Regret Stakes! There were 14 wins, 12 places, 8 show and earnings of $456,830; 49% of the starters finished first, second or third. 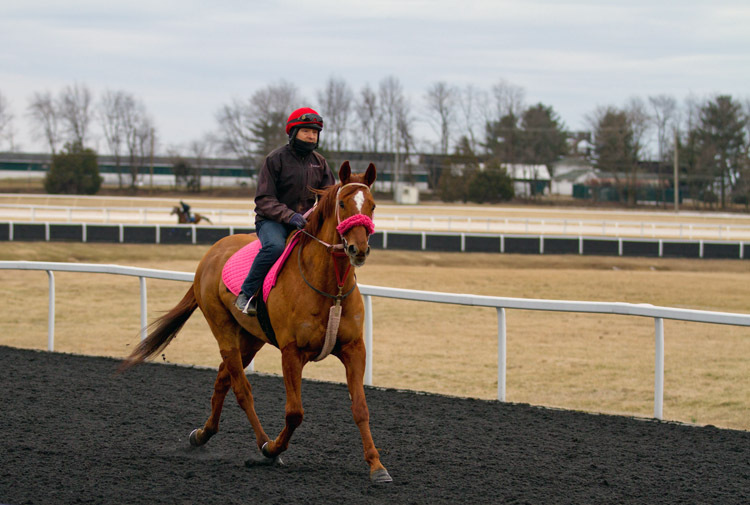 Spring Quality training over the Tapeta before his Grade I win Saturday! 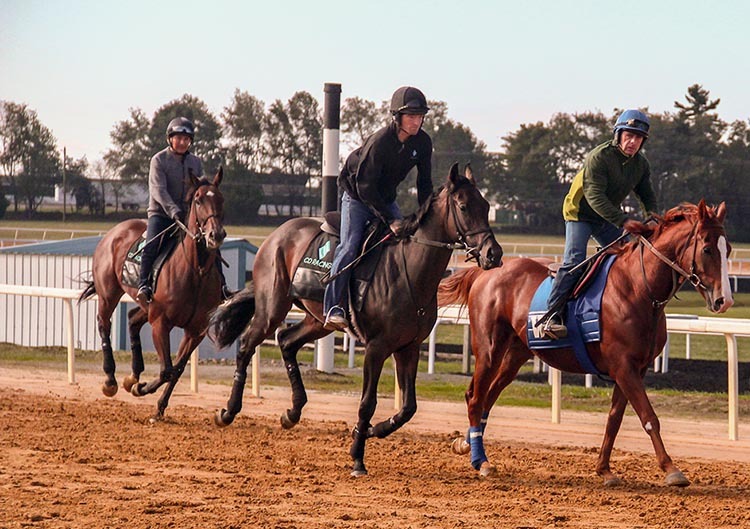 Fair Hill had 73 starters last week. There were 19 wins, 5 places, 10 show and earnings of $1,198,951; 47% of the starters finished first, second or third. Caribou Club with Pete McDermott aboard leaving the barn for training last week prior to winning his first graded stake! Fair Hill had 51 starters last week. There were 9 wins, 10 places, 5 show and earnings of $429,428; 47% of the starters finished first, second or third. There were 7 wins, 10 places, 8 show and earnings of $336,581; 45% of the starters finished first, second or third. 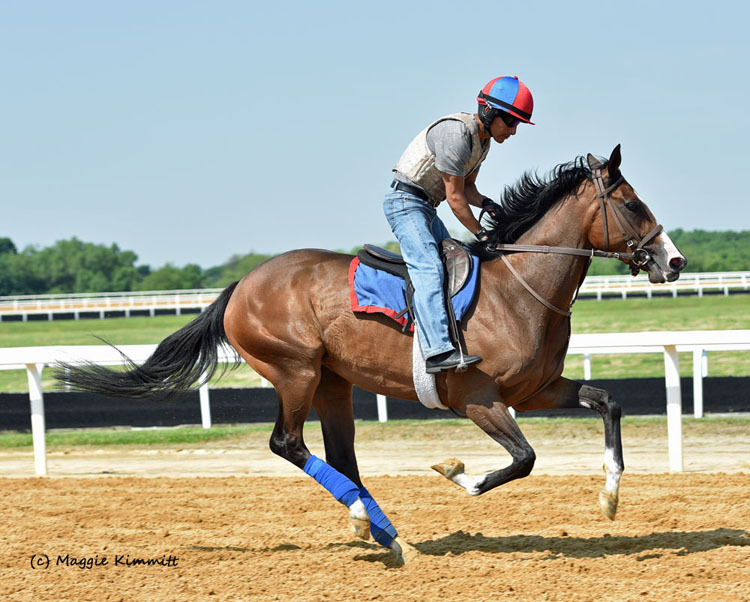 Irish War Cry with David Nava aboard, breezing at FHTC prior to winning the Pimlico Special on Friday! There were 6 wins, 9 places, 11 show and earnings of $646,500; 51% of the starters finished first, second or third. 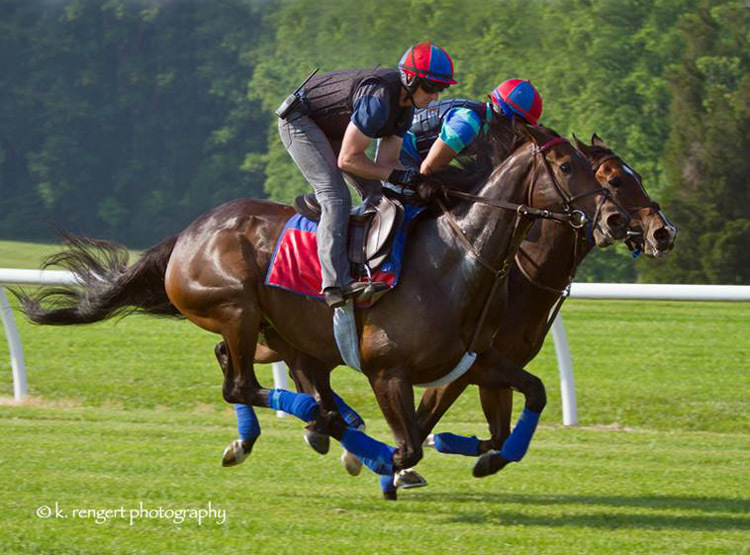 Berned (outside) with Jorge Salazar aboard in an easy breeze prior to winning Monmouth’s opening day stake on Saturday! There were 5 wins, 6 places, 8 show and earnings of $367,370; 40% of the starters finished first, second or third. Fair Hill had 62 starters last week. There were 8 wins, 16 places, 7 show and earnings of $504,056; 50% of the starters finished first, second or third. 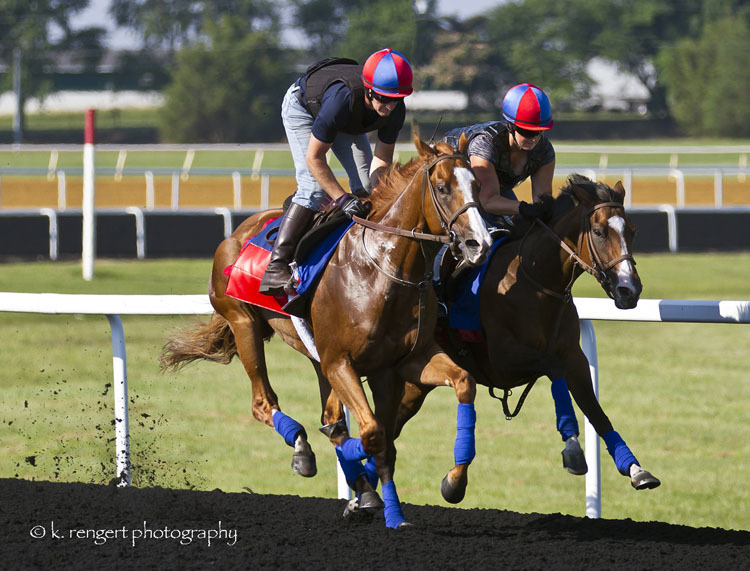 Lady Alexandra (inside) with Santiago Rodriguez aboard skipping over the Tapeta the week before her first stakes win! Fair Hill had 36 starters last week. There were 8 wins, 3 places, 5 show and earnings of $260,234; 44% of the starters finished first, second or third. Fair Hill had 41 starters last week. There were 6 wins, 6 places, 5 show and earnings of $424,884; 44% of the starters finished first, second or third. Fair Hill had 28 starters last week. There were 3 wins, 4 places, 7 show and earnings of $180,018; 50% of the starters finished first, second or third. A procession of greys heading home on another cold weekend! Fair Hill had 22 starters last week. There were 6 wins, 3 places, 1 show and earnings of $156,119; 45% of the starters finished first, second or third. The next generation of riders in training on Saturday morning! There were 2 wins, 2 places, 4 shows and earnings of $66,090; 53% of the starters finished first, second or third. 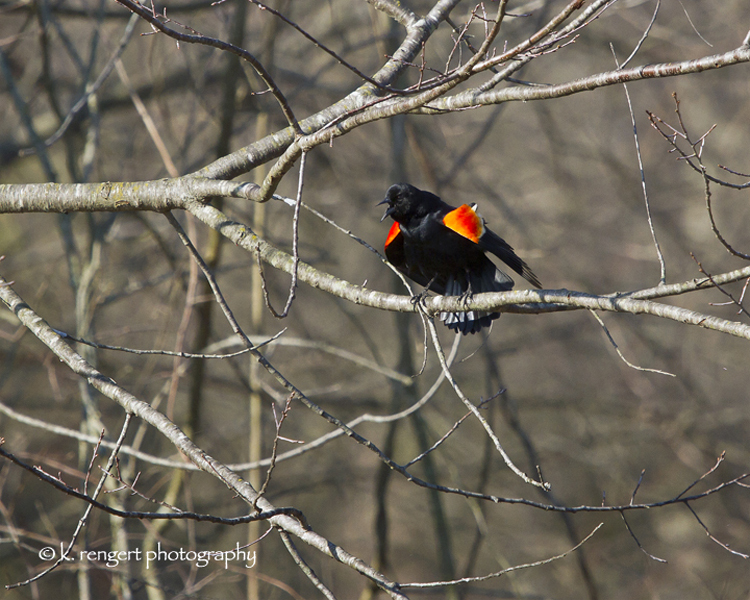 Spring is not quite here yet! Fair Hill had 13 starters last week. 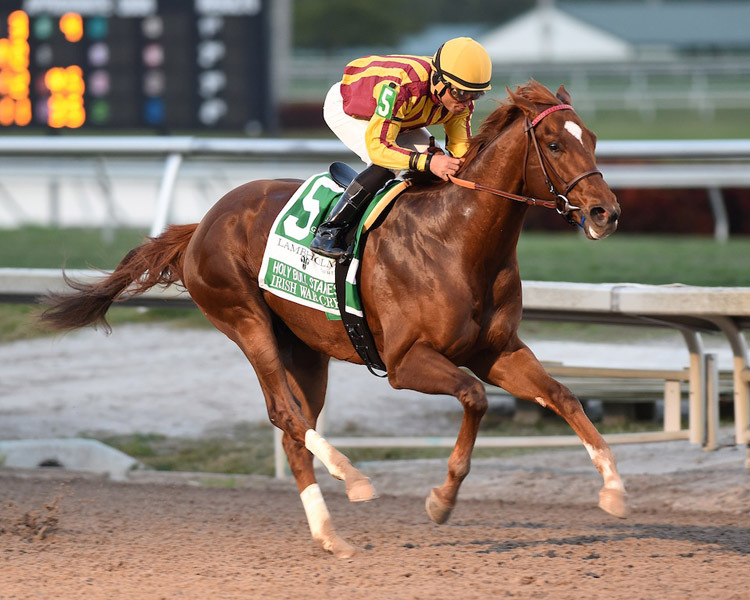 There were 1 place, 4 shows and earnings of $33,262; 38% of the starters finished first, second or third. Deer participating in morning training on Saturday! Fair Hill had 19 starters last week. There were 1 win, 4 places, 5 shows and earnings of $75,948; 53% of the starters finished first, second or third. 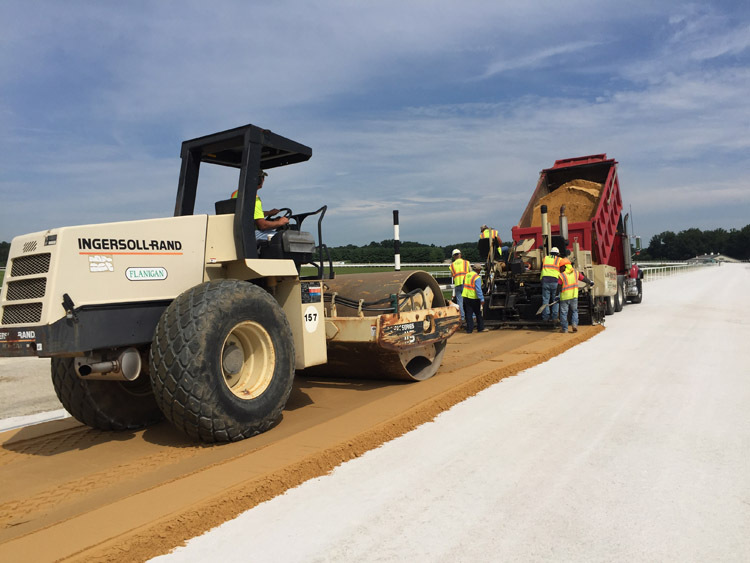 A busy Saturday on the Tapeta following last weeks's Nor'easter! There were 2 wins, 4 places, 4 shows and earnings of $87,483; 48% of the starters finished first, second or third. 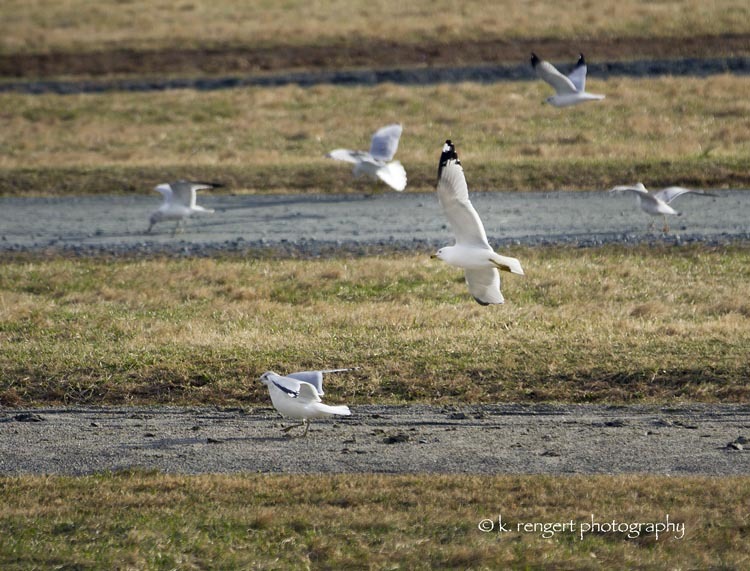 Seagulls blowing in the wind on Saturday! Fair Hill had 11 starters last week. There were 1 win, 2 places, 2 shows and earnings of $37,330; 45% of the starters finished first, second or third. 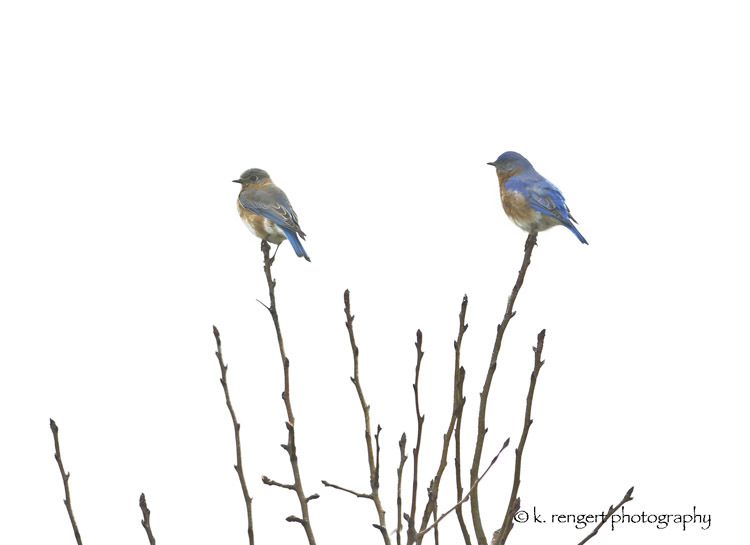 Mr. & Mrs. Bluebird reclaiming their nesting box at the main dirt track gap on Saturday – they are ready for spring! Fair Hill had 18 starters last week. There were 4 wins, 3 places, 6 shows and earnings of $144,631; 72% of the starters finished first, second or third. Truly a winter wonderland for training at FHTC yesterday, thankfully all snow was gone this morning! There were 3 wins, 1 place, 3 shows and earnings of $117,716; 32% of the starters finished first, second or third. 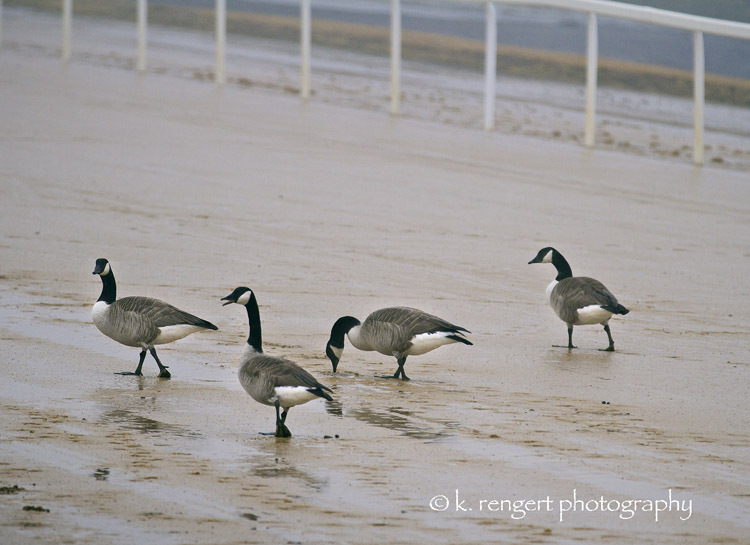 Geese waddling across the dirt track this past Sunday at FHTC! There were 1 win, 2 places, 1 show and earnings of $32,470; 21% of the starters finished first, second or third. There were 1 win, 3 places, 4 shows and earnings of $65,886; 44% of the starters finished first, second or third. In the Navy Now with Sarah Schaffer aboard, heading home after training at Christmas time! There were 1 win, 4 places, 2 shows and earnings of $112,165; 33% of the starters finished first, second or third. 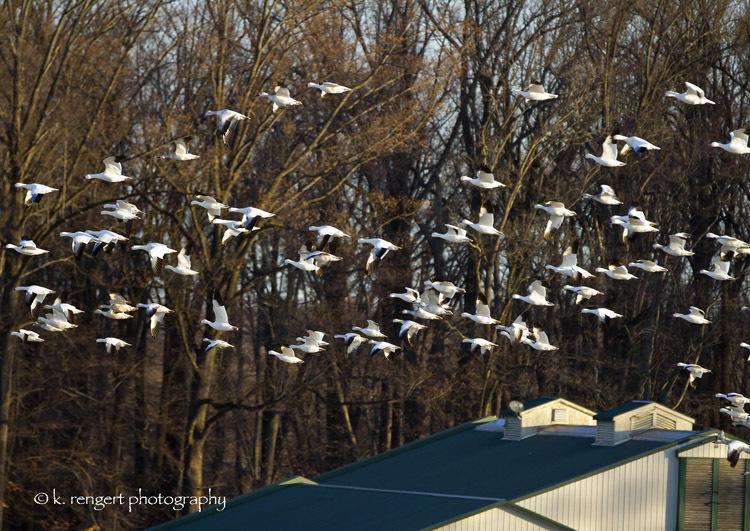 Snow Geese flying over Fair Hill this weekend! There were 2 wins, 5 places, 6 shows and earnings of $92,668; 46% of the starters finished first, second or third. 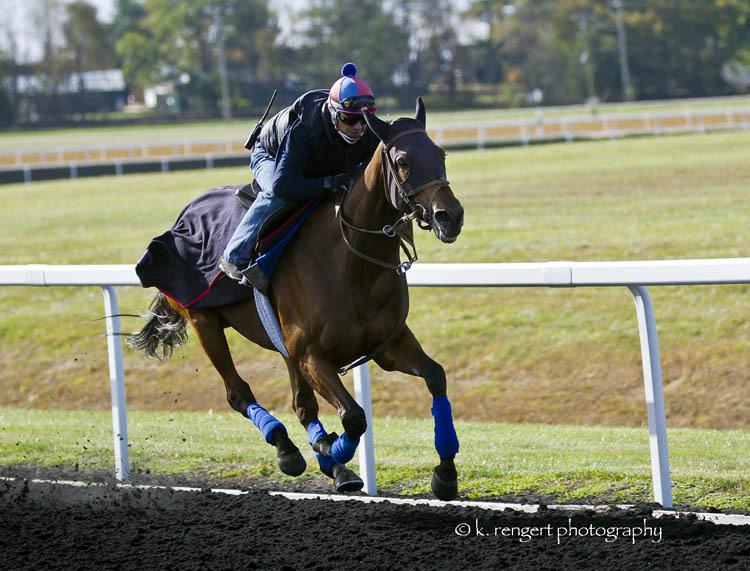 Ultra Brat with Elvin Caraballo aboard skipping over the Tapeta before heading to Florida after Thanksgiving! There were 3 wins, 5 shows and earnings of $89,661; 40% of the starters finished first, second or third. 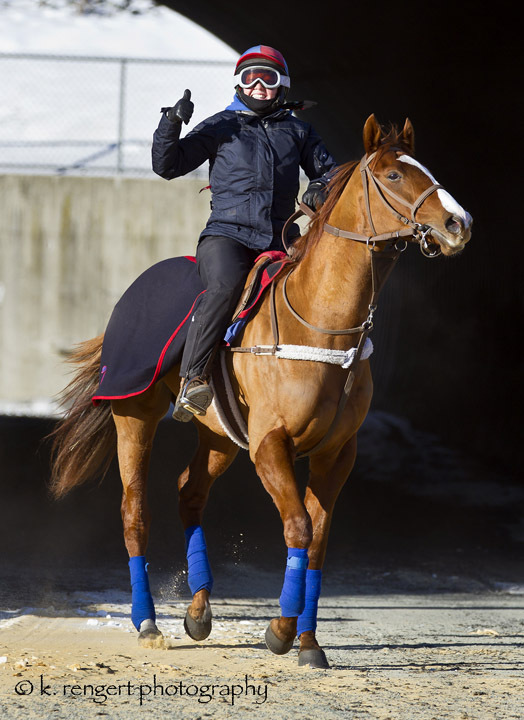 Horse and Rider all smiles on a frigid Sunday morning after training! 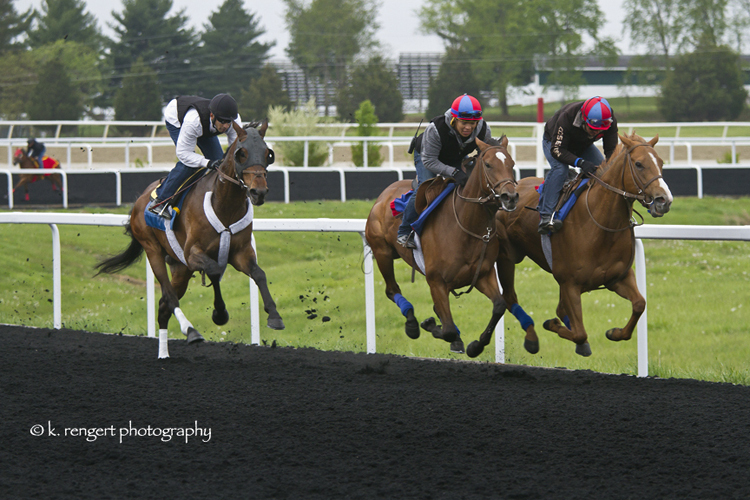 Fair Hill had 4 starters last week. 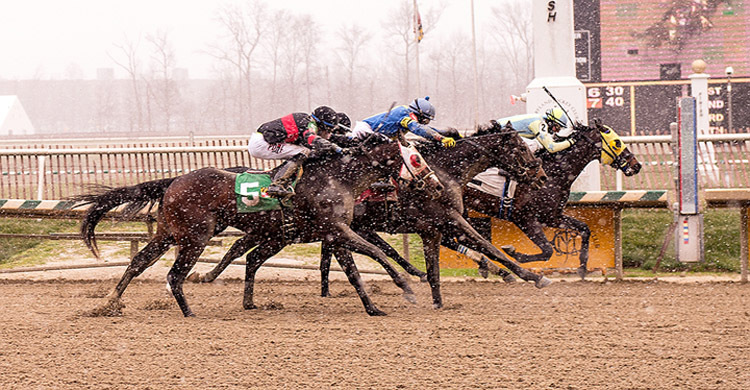 There was 1 win and earnings of $28,332; 25% of the starters finished first, second or third. 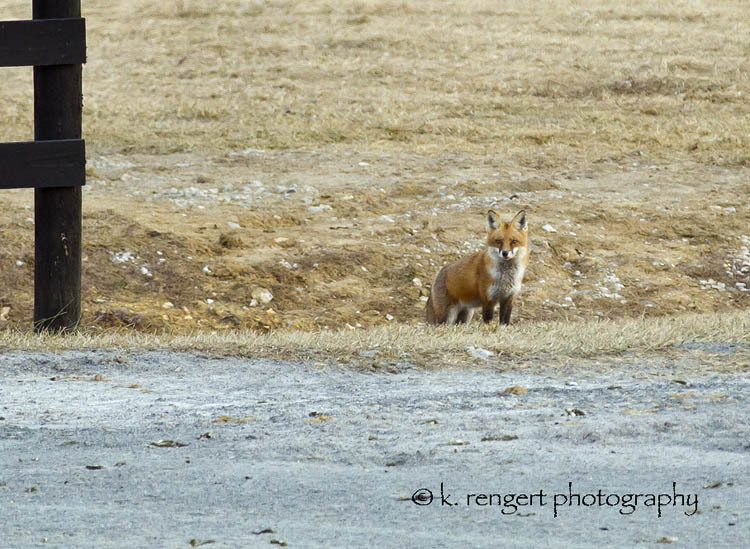 The Boxing Day fox stops for a look on his way past the clockers tower during training hours on Tuesday! Fair Hill had 12 starters last week. There were 3 wins, 1 show and earnings of $73,562; 33% of the starters finished first, second or third. There were 3 wins, 1 places, 1 shows and earnings of $57,862; 23% of the starters finished first, second or third. The sun rises over another snowy weekend at FHTC! There were 4 wins, 3 places, 9 shows and earnings of $130,106; 55% of the starters finished first, second or third. 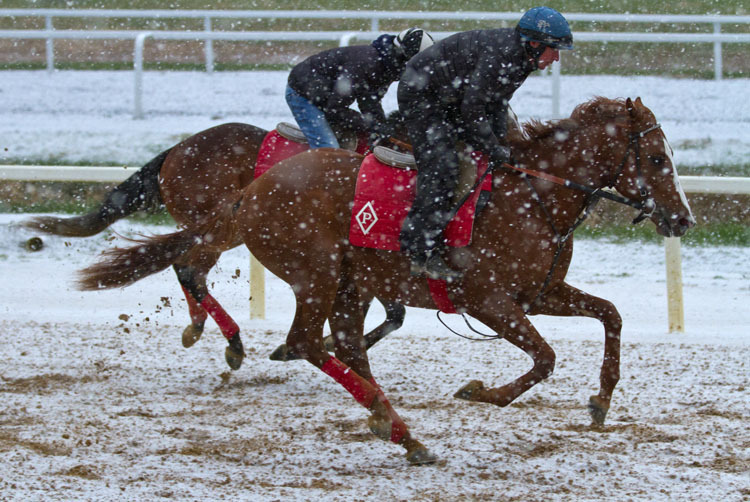 Training continues this Sunday over a snow covered Tapeta track! Fair Hill had 27 starters last week. There were 4 wins, 3 places, 6 shows and earnings of $129,690; 48% of the starters finished first, second or third. Jockey Trevor McCarthy is back at FHTC galloping horses to get fit for his return to race riding in January 2018! Fair Hill had 32 starters last week. There were 8 wins, 4 places, 7 shows and earnings of $252,642; 59% of the starters finished first, second or third. 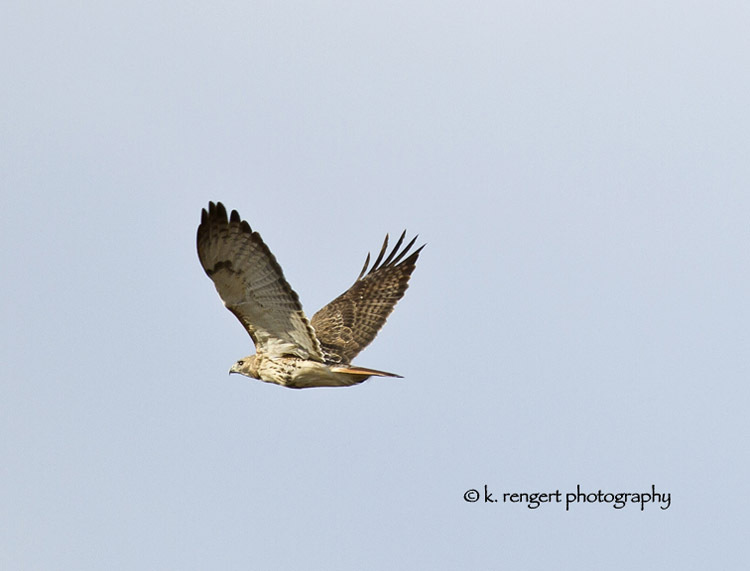 A Red-Tailed Hawk flying over to watch training on Sunday – he’s a regular visitor! Fair Hill had 87 starters last week. There were 8 wins, 13 places, 8 shows and earnings of $507,547; 33% of the starters finished first, second or third. 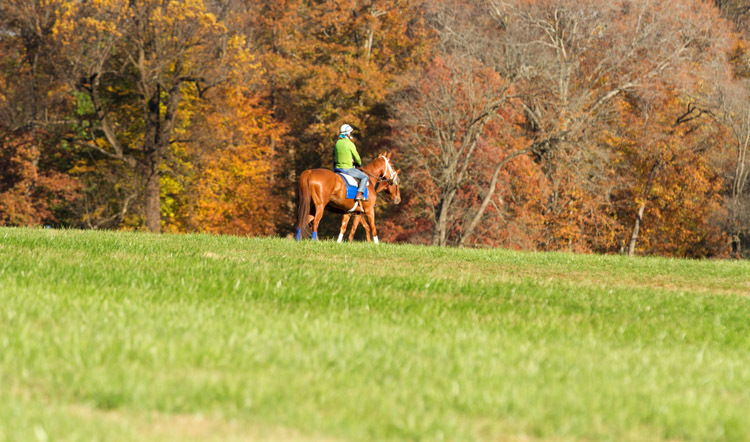 Fair Hill had 50 starters last week. There were 7 wins, 3 places, 7 shows and earnings of $208,712; 34% of the starters finished first, second or third. 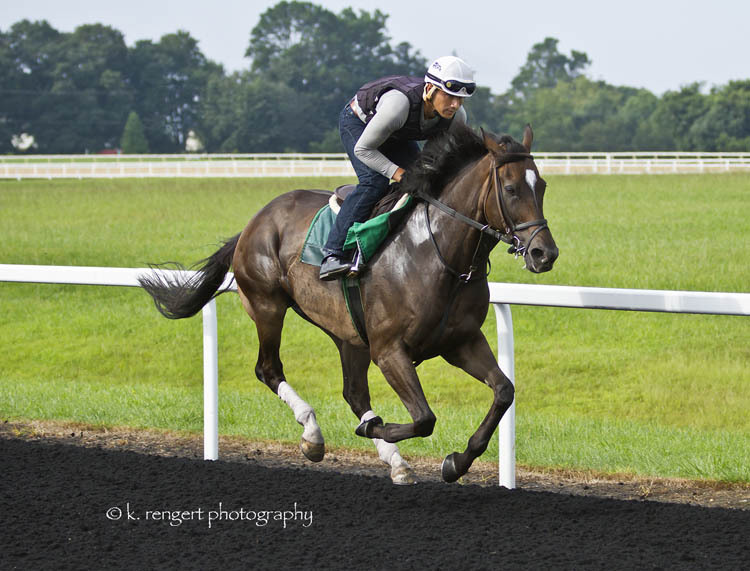 Spring Quality (outside) with Elvin Caraballo aboard, in his finally breeze prior to his first graded stakes win Saturday! There were 4 wins, 7 places, 5 shows and earnings of $324,105; 33% of the starters finished first, second or third. 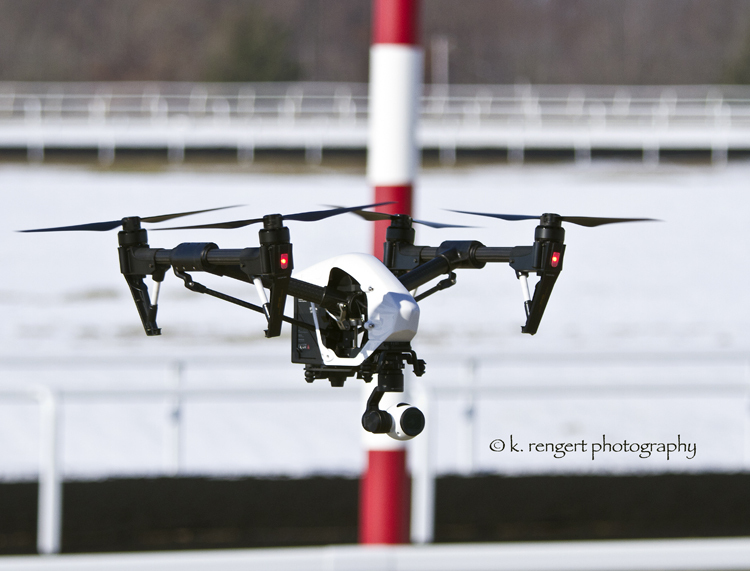 Arles (FR) with Anne Sinchak aboard, flying over the Tapeta prior to winning the Grade III Long Island Handicap! Fair Hill had 57 starters last week. There were 9 wins, 9 places, 8 shows and earnings of $589,742; 46% of the starters finished first, second or third. 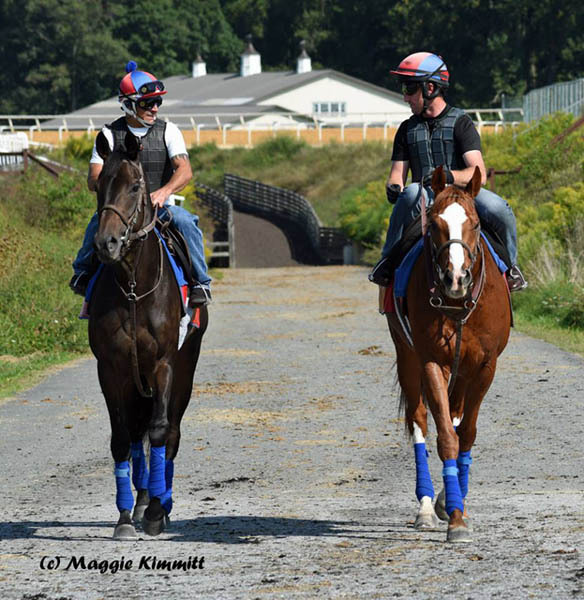 Untamed Domain (inside) and Maya Malibu in one last prep Saturday at FHTC before heading to Del Mar for the Breeders Cup! 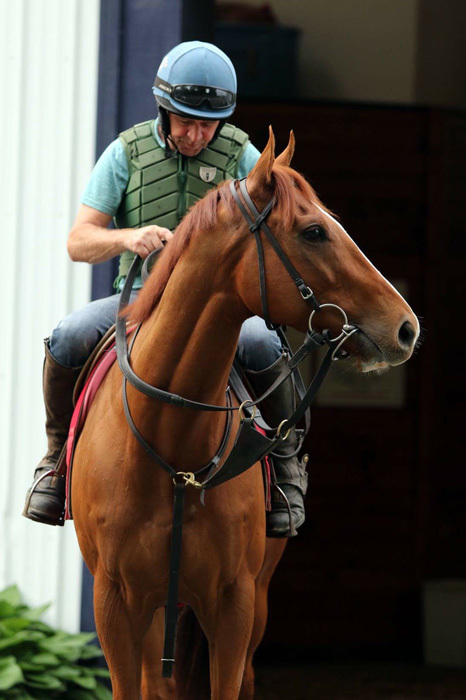 Fair Hill had 63 starters last week. There were 7 wins, 6 places, 8 shows and earnings of $312,172; 33% of the starters finished first, second or third. Fair Hill had 81 starters last week. There were 14 wins, 11 places, 12 shows and earnings of $822,286; 46% of the starters finished first, second or third. 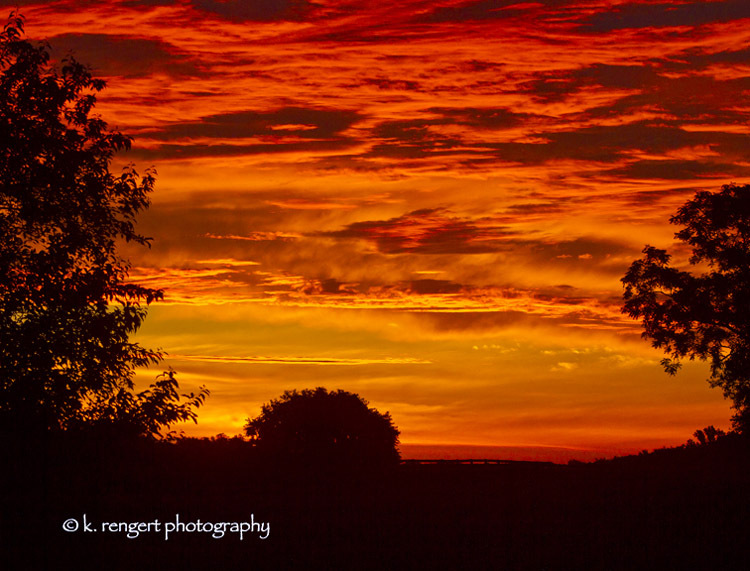 Early morning red sky last week preceding the wet weather! There were 9 wins, 12 places, 7 shows and earnings of $473,453; 43% of the starters finished first, second or third. 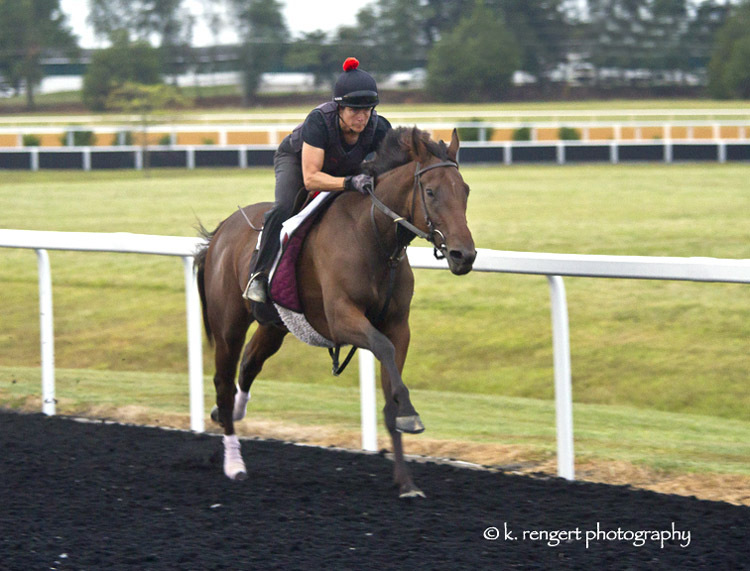 Zipessa, with Geo Garcia aboard, in her final workout prior to her first Grade I win at Keeneland on Saturday! There were 8 wins, 8 places, 14 shows and earnings of $696,741; 47% of the starters finished first, second or third. 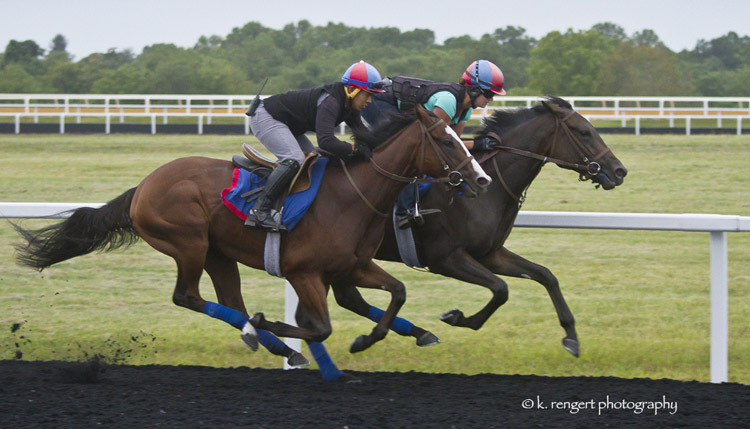 Just Howard (outside) with Anne Sinchak aboard breezing on the Tapeta prior to his first graded stakes win at Laurel! 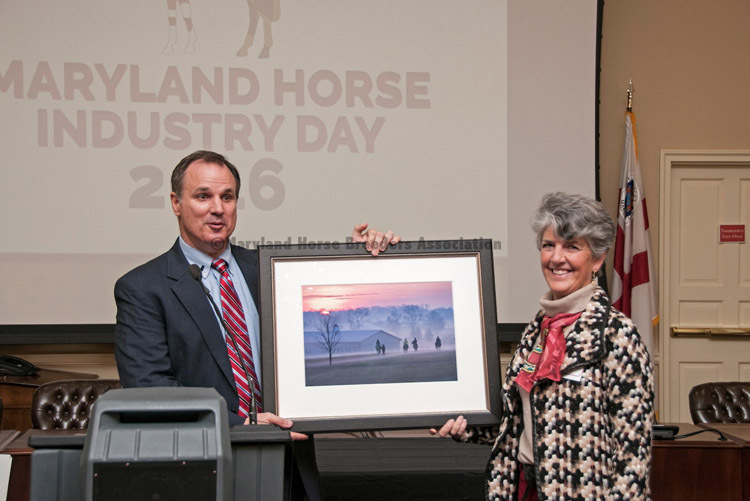 Fair Hill had 75 starters last week. There were 13 wins, 6 places, 11 shows and earnings of $566,332; 40% of the starters finished first, second or third. 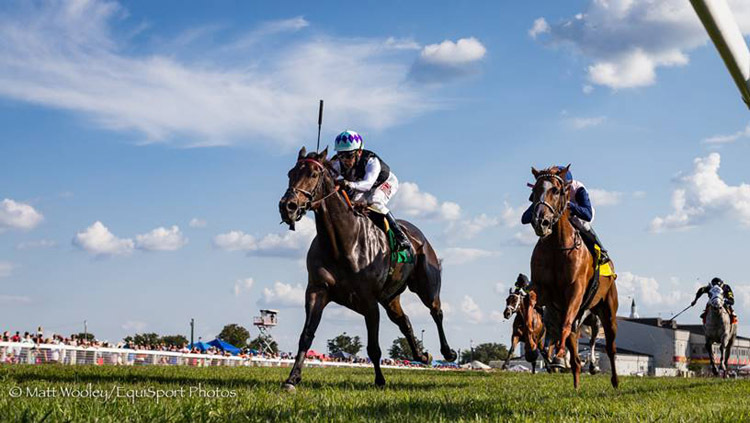 Tequilita with Peter Brette aboard flying over the FHTC dirt track prior to winning the Charles Town Oaks! There were 14 wins, 12 places, 4 shows and earnings of $776,636; 36% of the starters finished first, second or third. Fair Hill had 69 starters last week. There were 10 wins, 9 places, 12 shows and earnings of $829,022; 45% of the starters finished first, second or third. 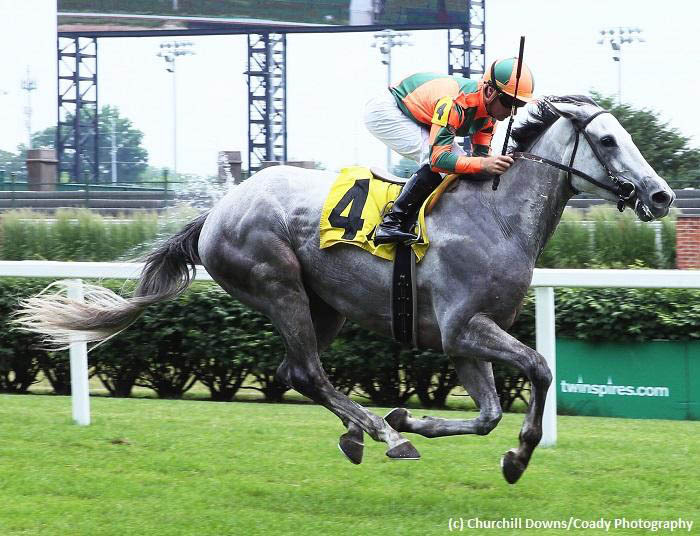 Miss Temple City edges away from a game Zipessa in the Grade III Kentucky Downs Ladies Turf Stake on Saturday! 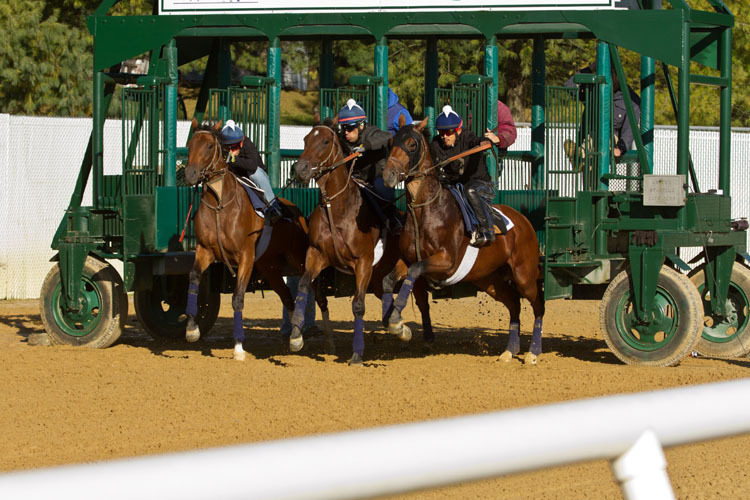 Fair Hill had 84 starters last week. There were 14 wins, 8 places, 15 shows and earnings of $1,020,357; 44% of the starters finished first, second or third. We Deer You (outside) with Jose Flores aboard breezing on the Tapeta prior to his first stakes win last Friday at Saratoga! There were 13 wins, 7 places, 3 shows and earnings of $504,330; 37% of the starters finished first, second or third. 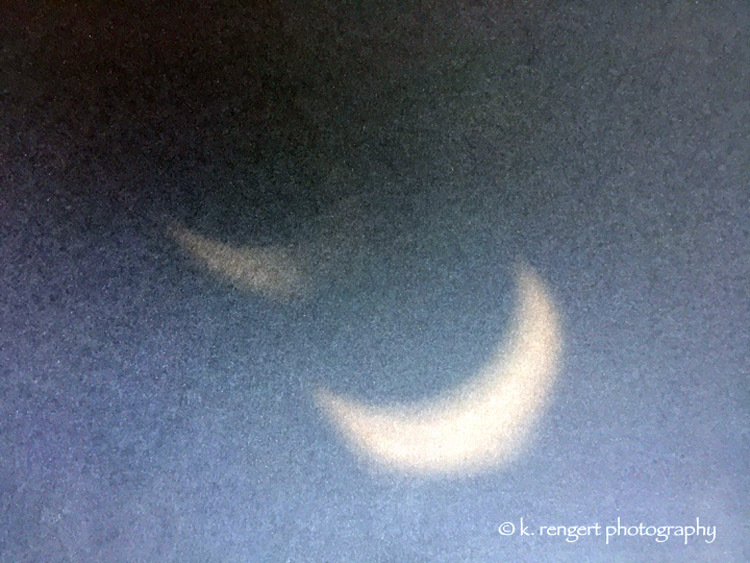 The horse photos this week were eclipsed! Fair Hill had 45 starters last week. There were 5 wins, 10 places, 6 shows and earnings of $235,258; 47% of the starters finished first, second or third. There were 12 wins, 8 places, 10 shows and earnings of $493,968; 50% of the starters finished first, second or third. Divining Rod (inside) with Leigh Delacour aboard cruising along on the tapeta prior to winning the Polynesian Stake on Saturday! There were 9 wins, 12 places, 15 shows and earnings of $493,220; 48% of the starters finished first, second or third. There were 12 wins, 7 places, 8 shows and earnings of $548,686; 42% of the starters finished first, second or third. 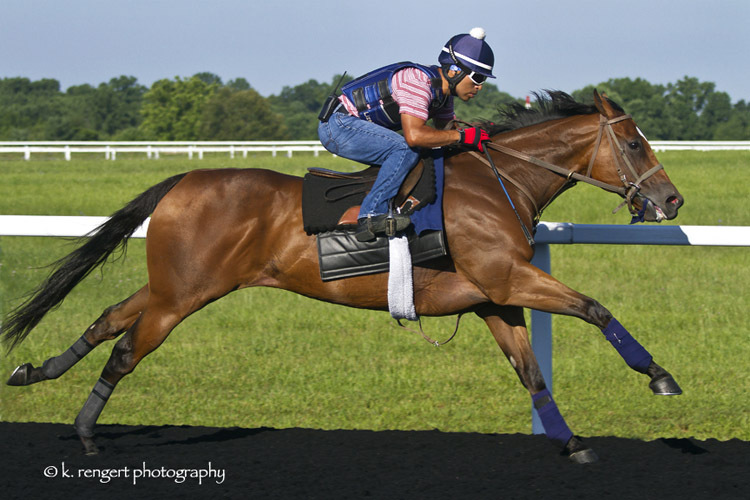 Miss Ella outside with Daniel Ortiz aboard breezing at FHTC prior to her repeat victory in the Caress Stake! 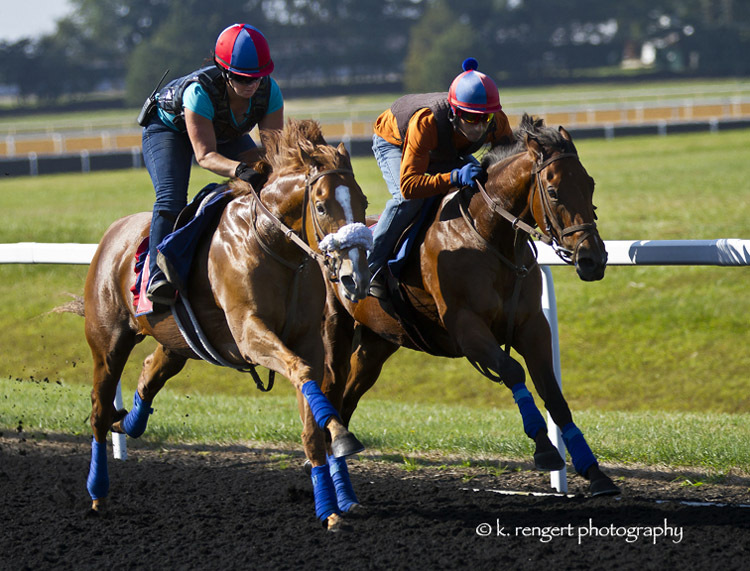 Fair Hill had 80 starters last week. There were 11 wins, 10 places, 13 shows and earnings of $637,404; 43% of the starters finished first, second or third. 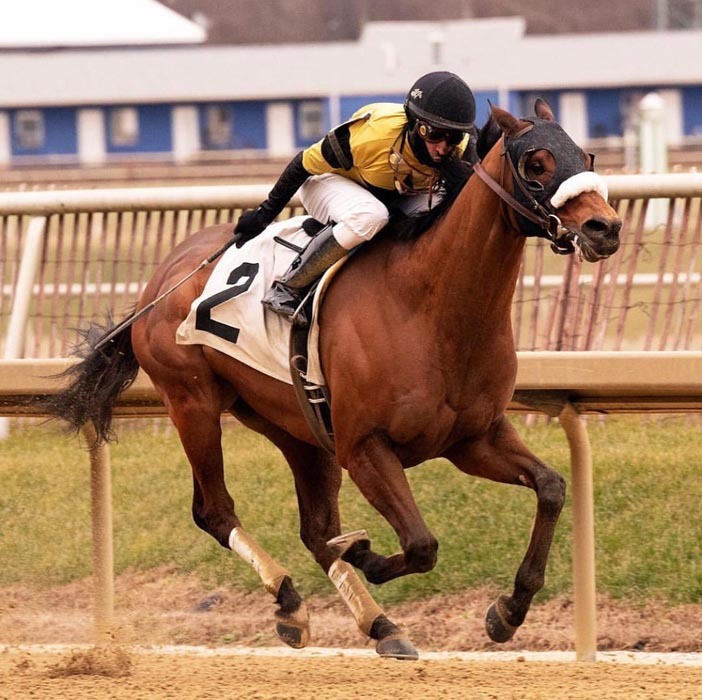 No Dozing with Leigh Delacour aboard breezing over the Tapeta prior to winning the Concern Stake at Laurel on Saturday! There were 9 wins, 11 places, 7 shows and earnings of $591,221; 44% of the starters finished first, second or third. There were 12 wins, 10 places, 14 shows and earnings of $431,111; 49% of the starters finished first, second or third. There were 11 wins, 9 places, 8 shows and earnings of $524,869; 38% of the starters finished first, second or third. 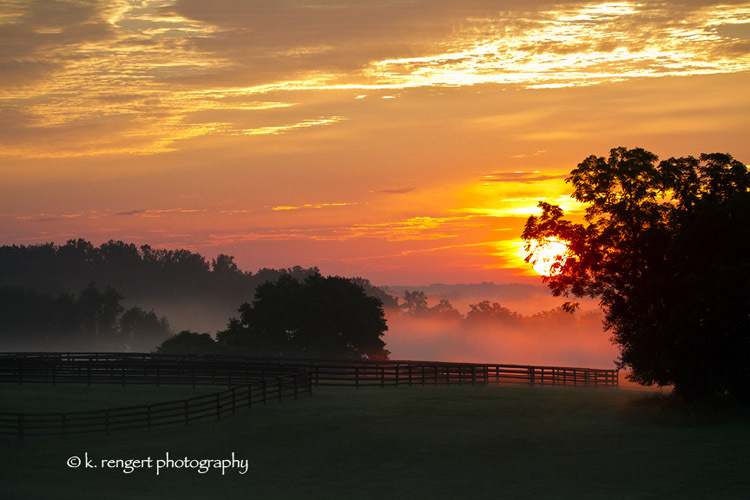 Sunrise over Fair Hill Sunday morning! Fair Hill had 68 starters last week. There were 10 wins, 9 places, 11 shows and earnings of $425,105; 44% of the starters finished first, second or third. 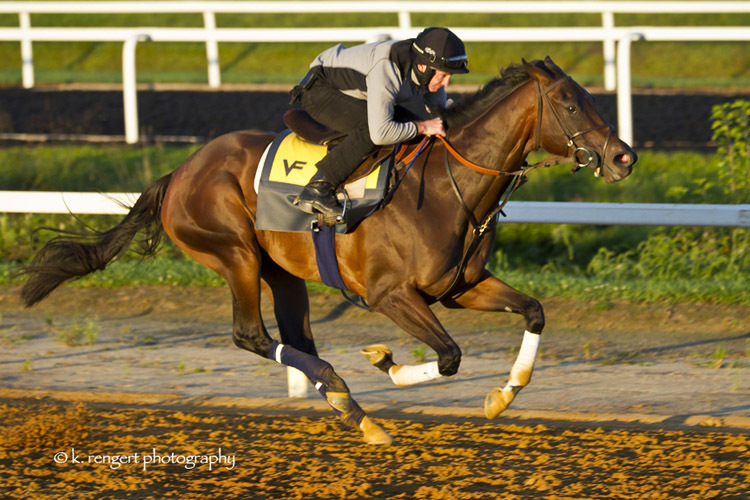 Proforma with Mitchell Murrill aboard breezing prior to his stake win on Saturday! There were 13 wins, 11 places, 9 shows and earnings of $495,328; 52% of the starters finished first, second or third. 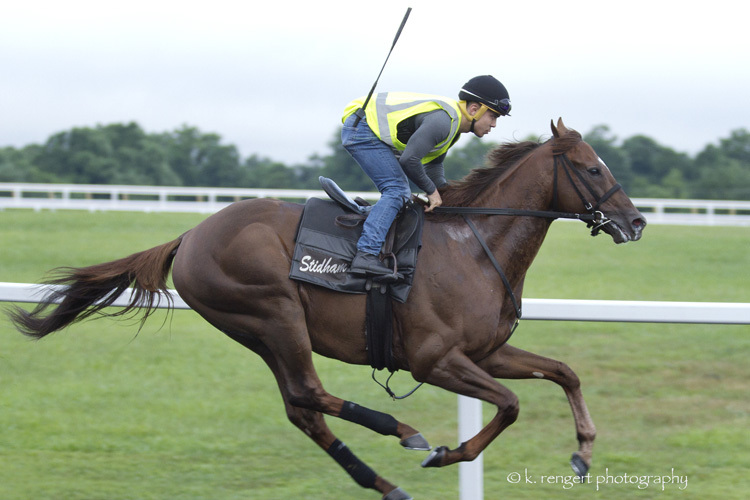 Journey Home, Mary Motion aboard, galloping on the Tapeta prior to her Christiana Stake win on Wednesday! There were 16 wins, 12 places, 7 shows and earnings of $534,174; 50% of the starters finished first, second or third. Ascend (inside) and Irish War Cry match strides in their final breeze leading up to Saturdays Grade I races at Belmont Park! Fair Hill had 83 starters last week. There were 17 wins, 11 places, 12 shows and earnings of $1,691,885; 48% of the starters finished first, second or third. Youngsters in training over the weekend! 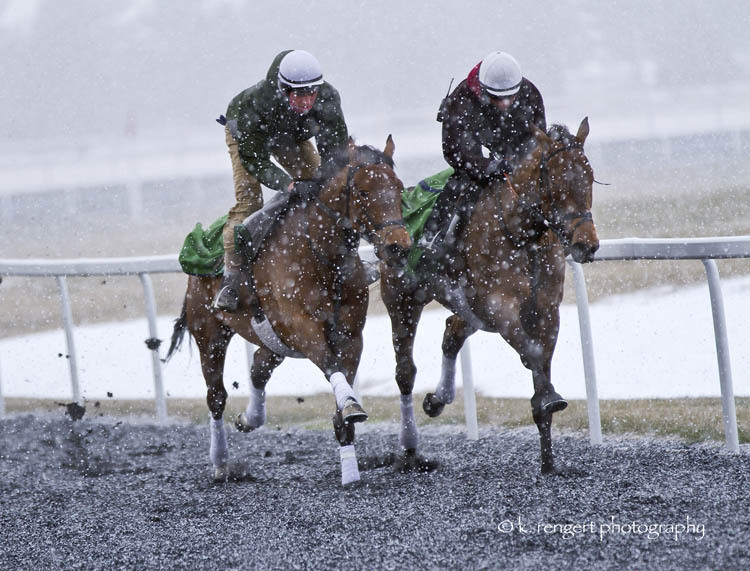 Fair Hill had 46 starters last week. There were 7 wins, 7 places, 7 shows and earnings of $360,999; 46% of the starters finished first, second or third. 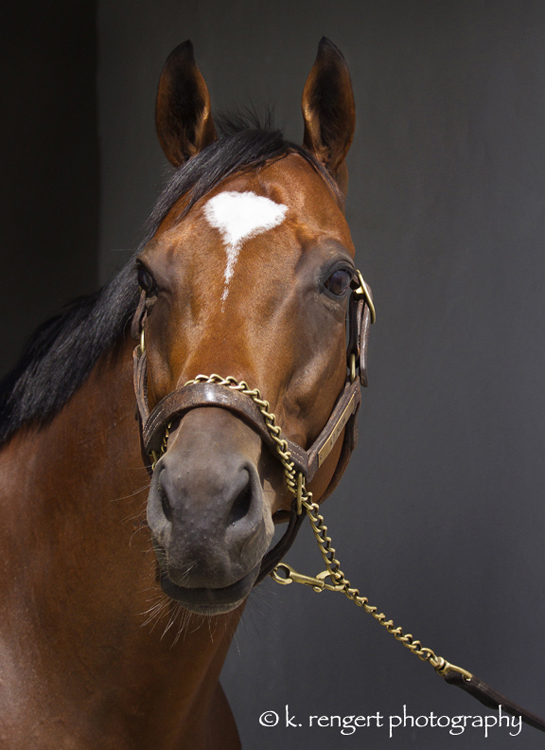 Irish Strait strikes a handsome pose yesterday – he’s definitely proud of himself as he should be!! Fair Hill had 67 starters last week. There were 14 wins, 8 places, 9 shows and earnings of $427,474; 46% of the starters finished first, second or third. 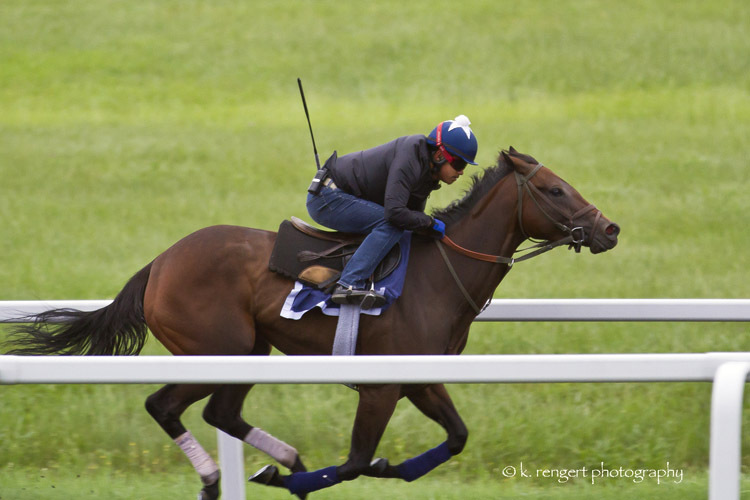 Fair Hill had 78 starters last week. There were 13 wins, 16 places, 7 shows and earnings of $776,059; 46% of the starters finished first, second or third. 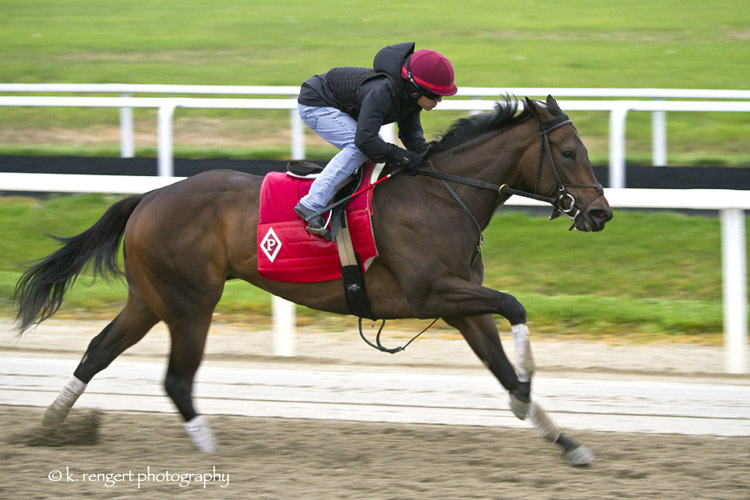 Hawksmoor(IRE) outside, Moises Navas aboard, breezing on the Tapeta prior to her victory in the Beaugay Stake! There were 10 wins, 4 places, 4 shows and earnings of $340,198; 55% of the starters finished first, second or third. Dramatic sky on Saturday during training! There were 8 wins, 9 places, 10 shows and earnings of $359,775; 51% of the starters finished first, second or third. There were 4 wins, 9 places, 6 shows and earnings of $238,974; 37% of the starters finished first, second or third. Party Boat relaxing in her stall after a big stakes win on Sunday at Aqueduct! There were 10 wins, 6 places, 4 shows and earnings of $373,559; 45% of the starters finished first, second or third. 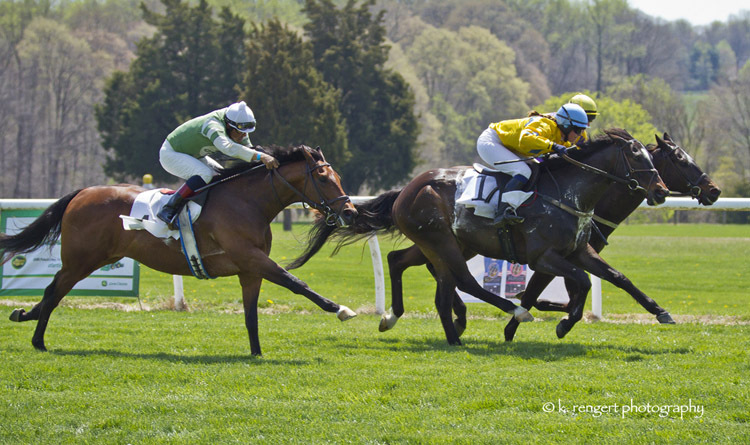 Fair Hill Trainers and Riders getting in on the action at the Fair Hill Point-to-Point this past Saturday! There were 3 wins, 3 places, 4 shows and earnings of $123,221; 31% of the starters finished first, second or third. Irish War Cry taking it easy on the way to the track for a work before the Wood Memorial! There were 3 wins, 2 places, 5 shows and earnings of $503,513; 37% of the starters finished first, second or third. 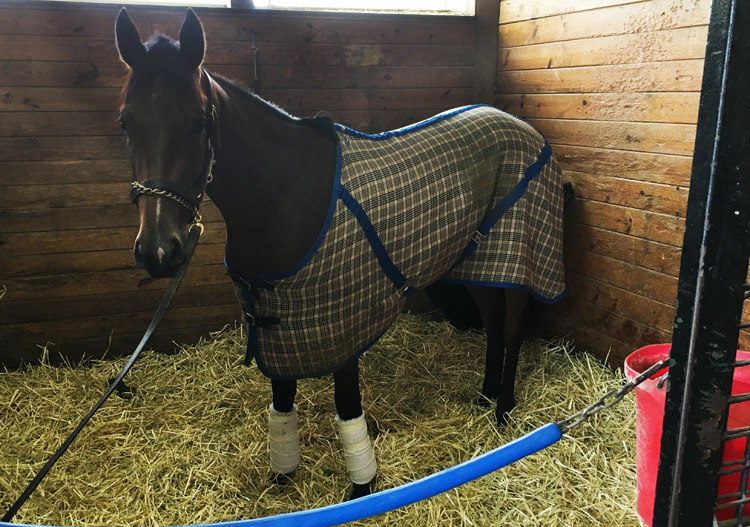 Miss Temple City looking happy and strong after her recent return to FHTC! There were 1 win, 3 shows and earnings of $35,360; 29% of the starters finished first, second or third. 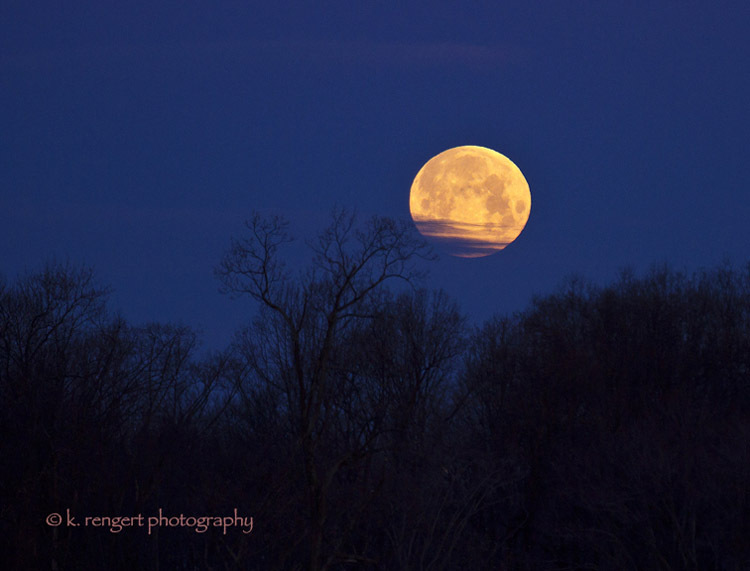 Mid March full moon at FHTC! Fair Hill had 7 starters last week. There were 1 win, 2 places, 2 shows and earnings of $30,132; 71% of the starters finished first, second or third. Sunday morning sunrise - training conditions slowly returning to normal as the ice slowly melts! There were 1 win, 2 places, 5 shows and earnings of $66,641; 57% of the starters finished first, second or third. 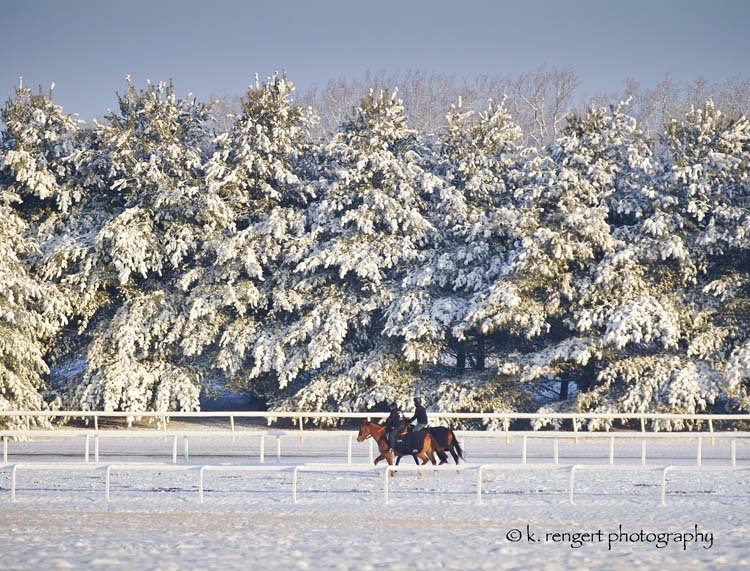 Horses and riders bundled up again as another cold snap hits! There were 4 wins, 2 places, 1 show and earnings of $104,259; 41% of the starters finished first, second or third. There were 3 wins, 2 places, 1 show and earnings of $63,319; 50% of the starters finished first, second or third. 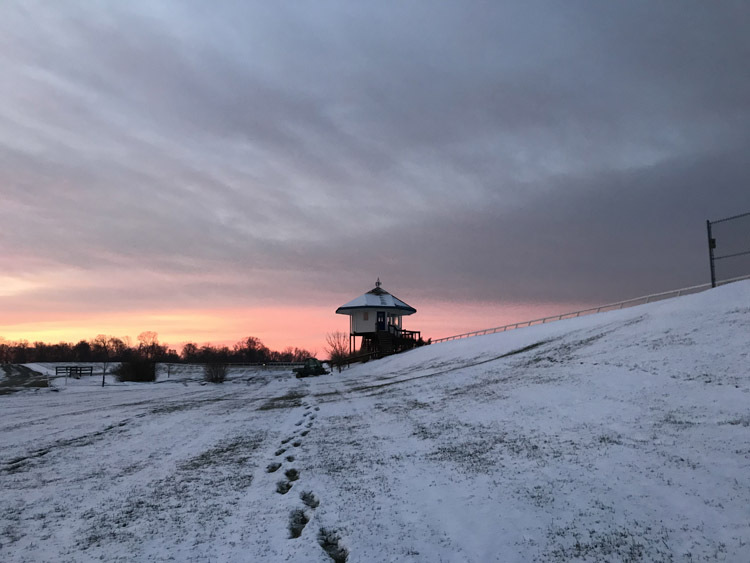 Saturday morning sunrise from the Clocker’s Tower – Wow, hard to believe it’s still February! There were 2 wins, 6 places and earnings of $92,316; 53% of the starters finished first, second or third. 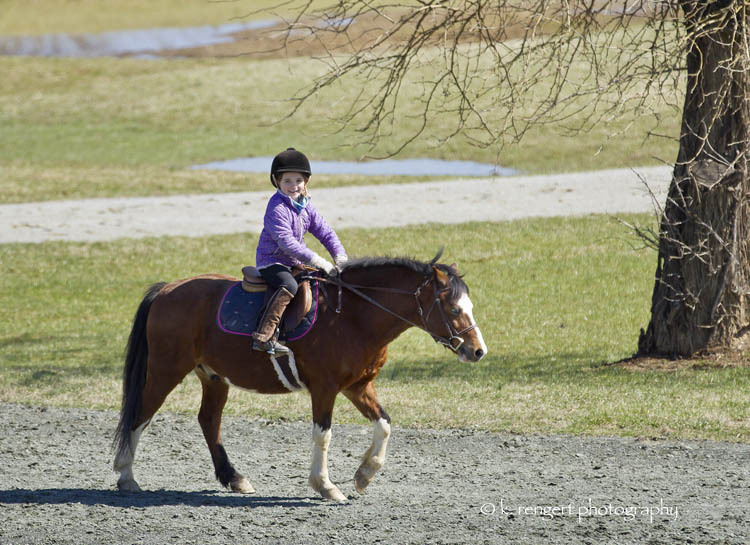 Youngsters and riders enjoying training in the spring like weather this past Sunday! There were 7 wins, 3 places, 3 shows and earnings of $160,100; 43% of the starters finished first, second or third. 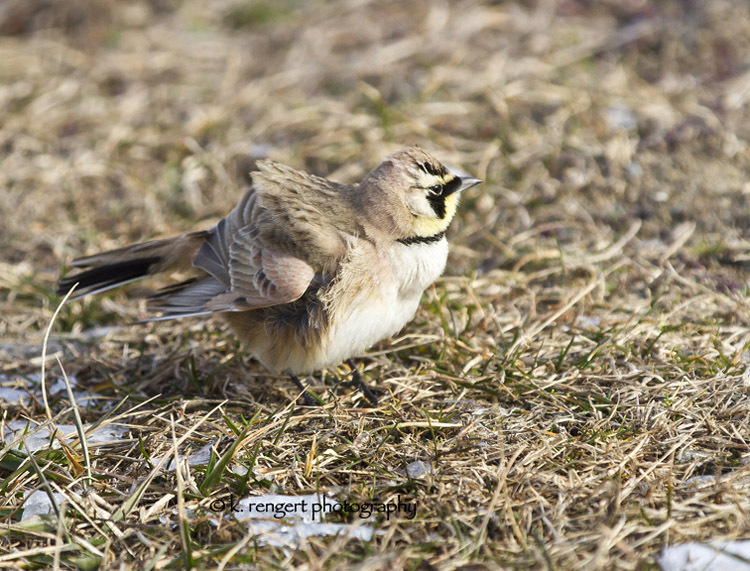 Horned Lark out in the cold at the Tapeta gap on Saturday! There were 4 wins, 1 place, 3 shows and earnings of $99,794; 40% of the starters finished first, second or third. There were 1 win, 5 places, 2 shows and earnings of $90,782; 50% of the starters finished first, second or third. Training in the snow on Saturday! There were 3 wins, 3 places, and earnings of $90,782; 43% of the starters finished first, second or third. 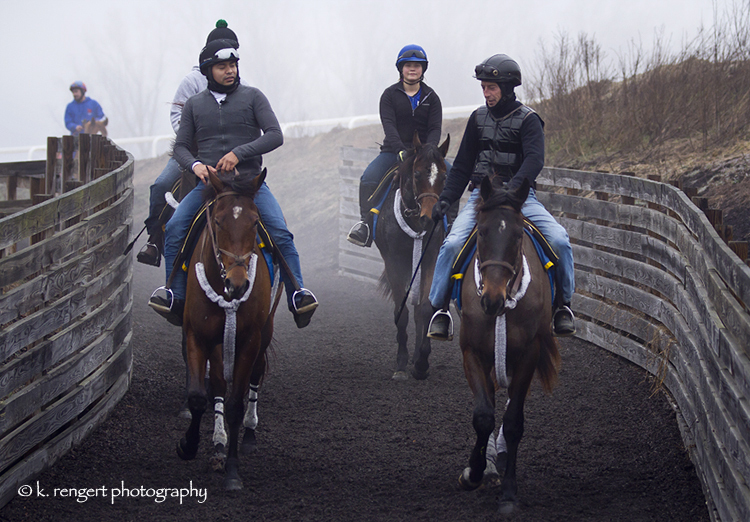 Youngsters heading home from the Tapeta track Saturday morning in the fog! Fair Hill had 17 starters last week. There were 3 wins, 1 show and earnings of $49,070; 24% of the starters finished first, second or third. 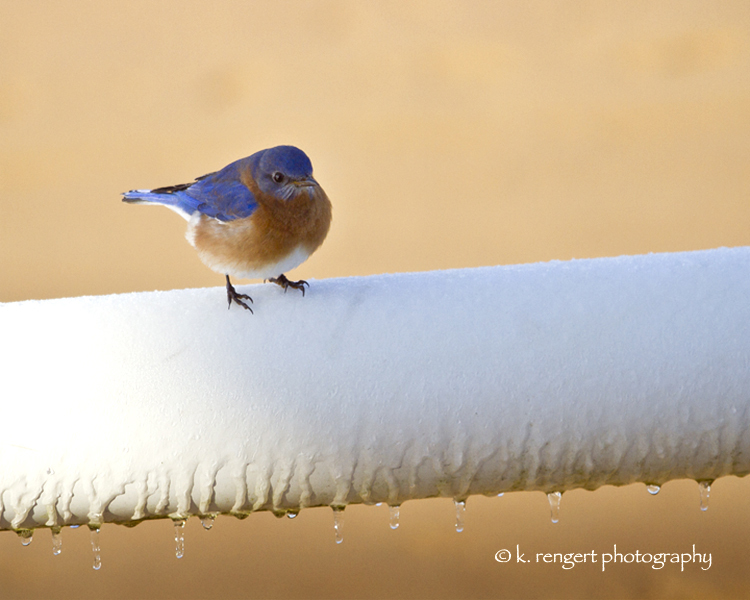 Bluebird enjoying an icy morning at the tower Sunday! There were 0 wins, 4 places, 2 shows and earnings of $53,533; 32% of the starters finished first, second or third. 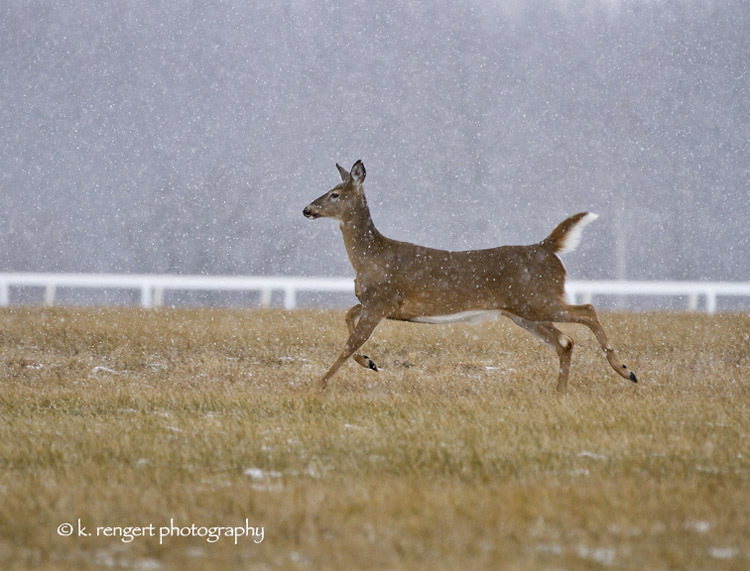 Deer struts through the infield during Saturday morning training! There were 5 wins, 1 places, 1 shows and earnings of $86,577; 35% of the starters finished first, second or third. 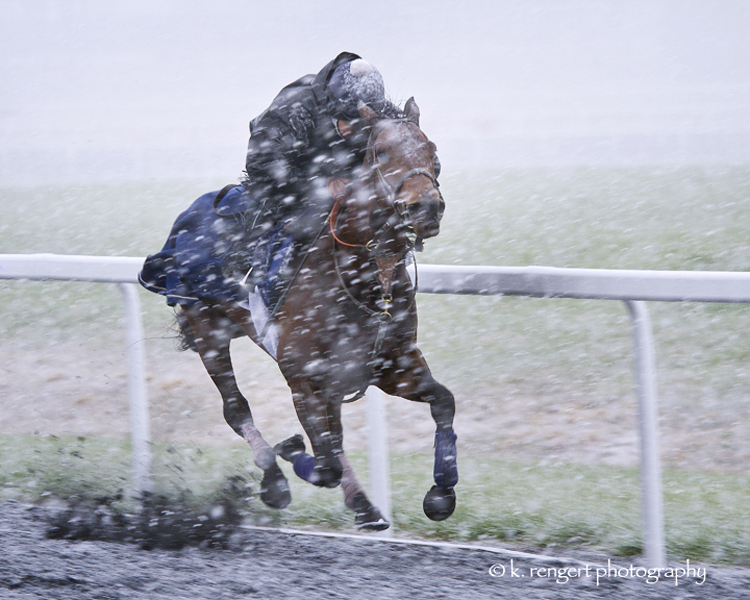 Irish War Cry with Jorge Salazar aboard, flexing his muscles on the Tapeta last month! There were 4 wins, 4 places, 2 shows and earnings of $177,927; 34% of the starters finished first, second or third. There were 1 wins, 1 places, 4 shows and earnings of $42,957; 35% of the starters finished first, second or third. 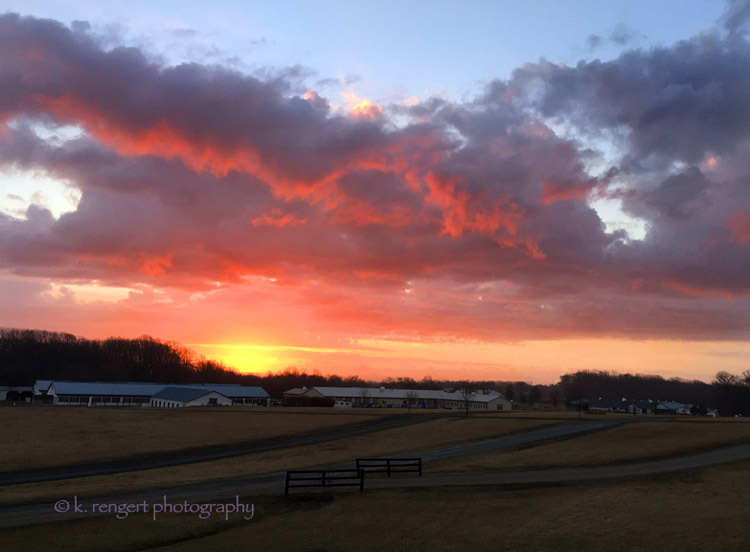 A beautiful winter morning at FHTC! There were 2 wins, 6 places, 3 shows and earnings of $111,377; 52% of the starters finished first, second or third. There were 5 wins, 0 places, 4 shows and earnings of $118,919; 35% of the starters finished first, second or third. There were 3 wins, 5 places, 7 shows and earnings of $133,769; 33% of the starters finished first, second or third. There were 12 wins, 11 places, 7 shows and earnings of $550,352; 55% of the starters finished first, second or third. There were 5 wins, 6 places, 6 shows and earnings of $272,951; 30% of the starters finished first, second or third. There were 9 wins, 6 places, 5 shows and earnings of $316,355; 37% of the starters finished first, second or third. Another relaxing fall morning at FHTC, look at the colors! Fair Hill had 49 starters last week. There were 8 wins, 4 places, 2 shows and earnings of $369,340; 29% of the starters finished first, second or third. There were 4 wins, 12 places, 7 shows and earnings of $693,063; 37% of the starters finished first, second or third. There were 16 wins, 5 places, 12 shows and earnings of $693,063; 49% of the starters finished first, second or third. 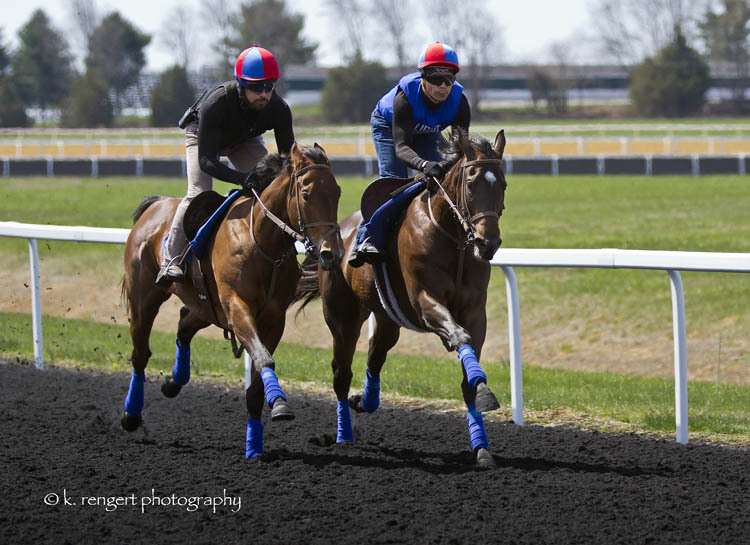 Miss Ella (outside), Becky Dang astride, in her final breeze prior to winning the Grade III stake at Keeneland on Friday! Fair Hill had 92 starters last week. There were 12 wins, 12 places, 12 shows and earnings of $533,034; 39% of the starters finished first, second or third. 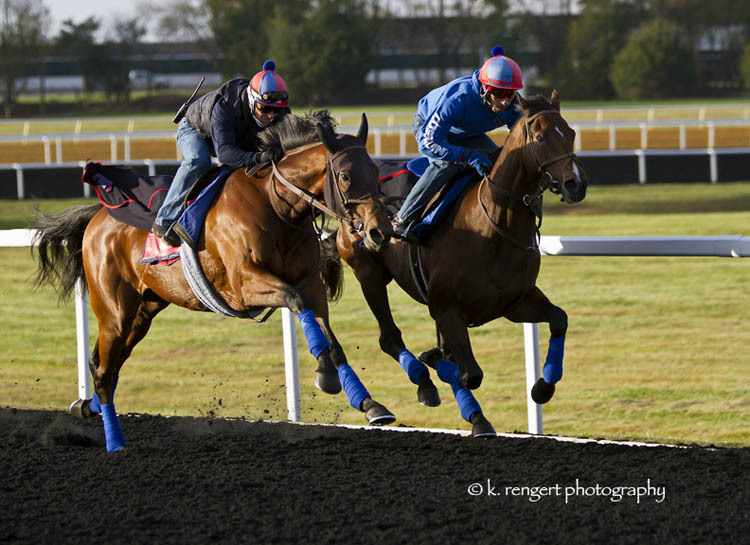 Miss Temple City (outside), Robbie Walsh aboard, breezing on the turf prior to winning the Grade I Shadwell Turf Mile! There were 16 wins, 10 places, 13 shows and earnings of $1,475,015; 46% of the starters finished first, second or third. A foggy morning at FHTC before the rains moved in to stay for a while last week! Fair Hill had 42 starters last week. There were 4 wins, 8 places, 7 shows and earnings of $316,164; 45% of the starters finished first, second or third. Fair Hill had 79 starters last week. There were 10 wins, 7 places, 11 shows and earnings of $461,025; 35% of the starters finished first, second or third. 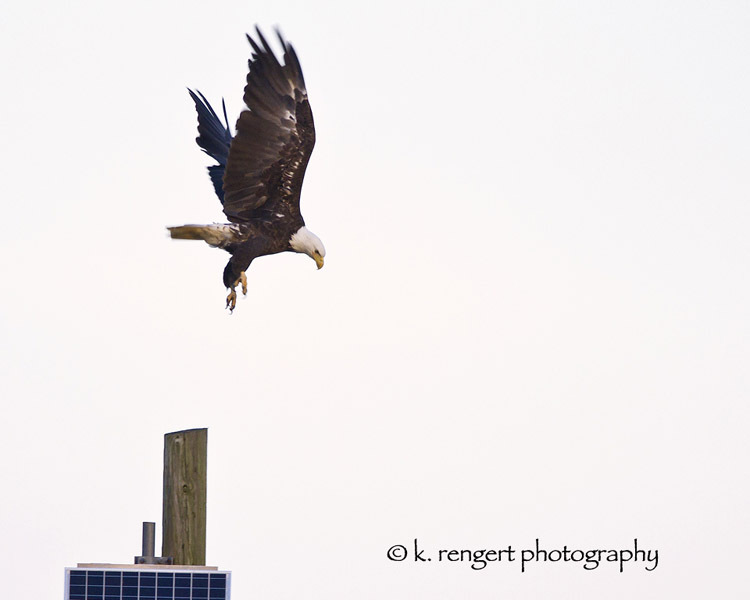 Bald Eagle swooping down on unwary riders from his perch on our dirt track speaker pole! There were 10 wins, 13 places, 7 shows and earnings of $575,405; 44% of the starters finished first, second or third. 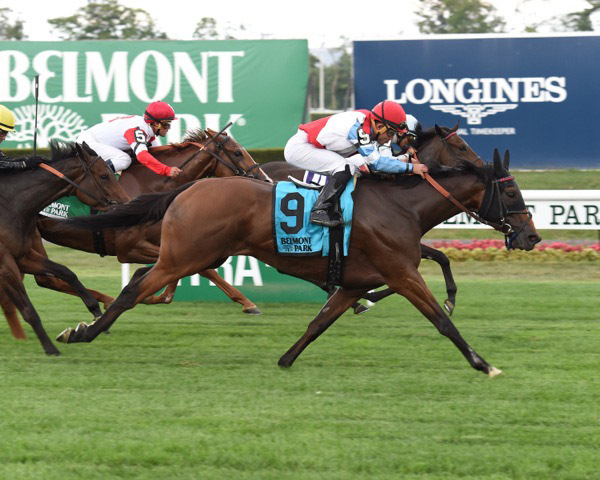 Ultra Brat defeats FHTC rivals Miss Katie Mae (2nd) and Most Beautiful (4th) in Belmont’s Christiecat Stake opening day! 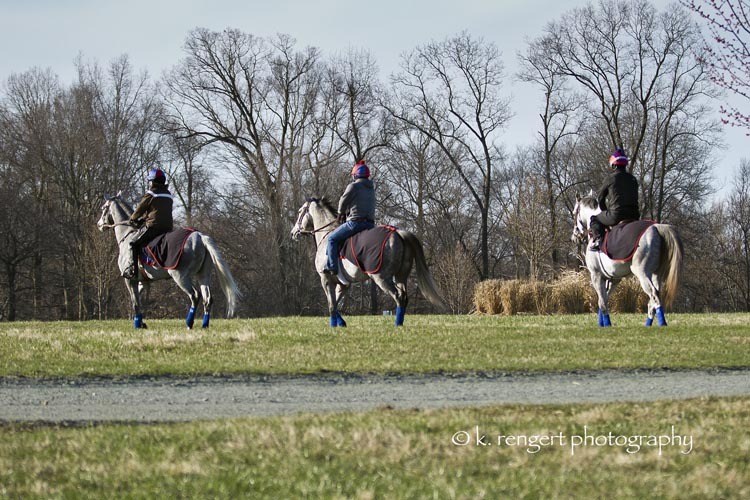 Fair Hill had 106 starters last week. There were 19 wins, 16 places, 17 shows and earnings of $1,100,890; 49% of the starters finished first, second or third. 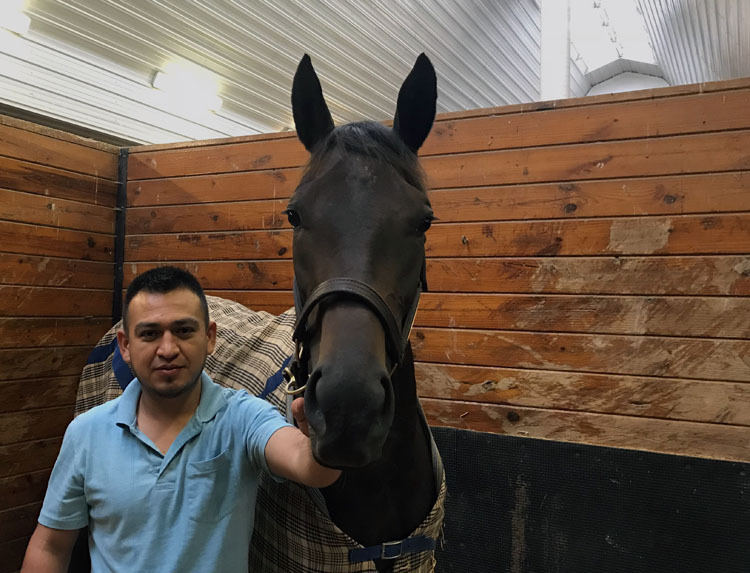 Black Mission Fig with Ennis Guerrerto aboard loves the life at FHTC! 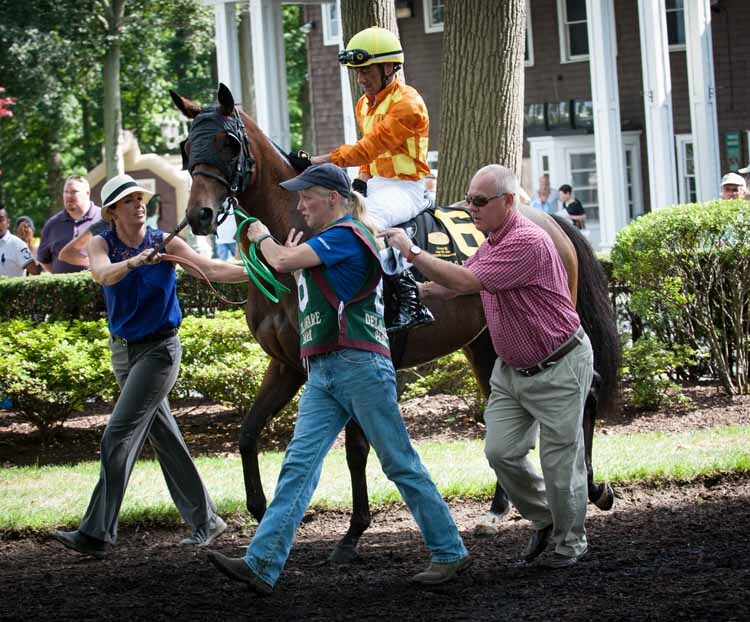 There were 12 wins, 7 places, 7 shows and earnings of $462,9946; 46% of the starters finished first, second or third. There were 8 wins, 8 places, 7 shows and earnings of $672,286; 45% of the starters finished first, second or third. There were 5 wins, 6 places, 9 shows and earnings of $425,184; 36% of the starters finished first, second or third. The new dirt track opened yesterday – in spite of the heat, the riders are all smiles this morning! There were 12 wins, 9 places, 10 shows and earnings of $445,000; 51% of the starters finished first, second or third. In with the new... Cushion installation started today!! There were 11 wins, 7 places, 15 shows and earnings of $530,635; 44% of the starters finished first, second or third. There were 16 wins, 4 places, 5 shows and earnings of $757,054; 45% of the starters finished first, second or third. 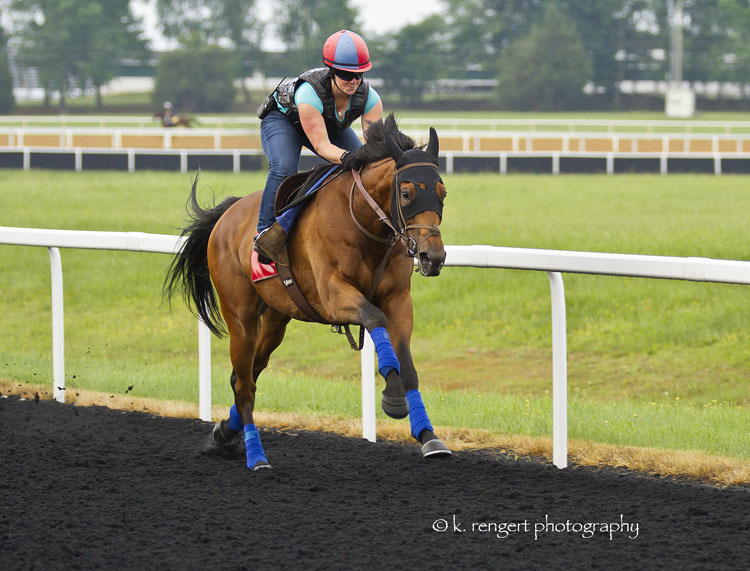 Tin Type Gal (inside) in company with Sherini breezing over the turf course at Fair Hill last week prior to her Grade III win! There were 15 wins, 13 places, 9 shows and earnings of $616,629; 52% of the starters finished first, second or third. Out with the old... 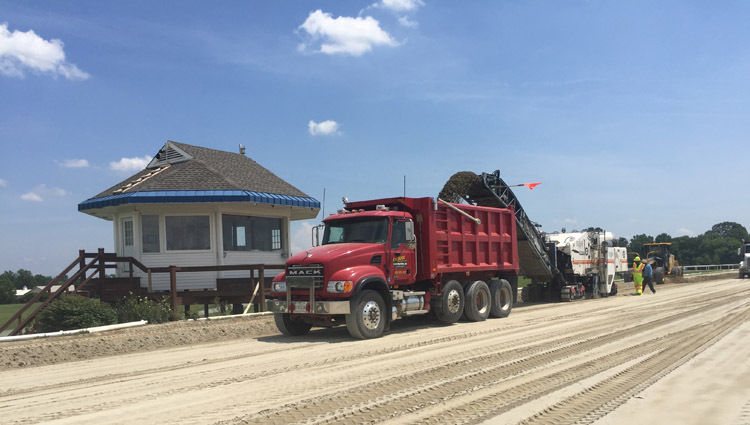 Dirt track resurfacing begins! There were 11 wins, 7 places, 6 shows and earnings of $392,463; 46% of the starters finished first, second or third. 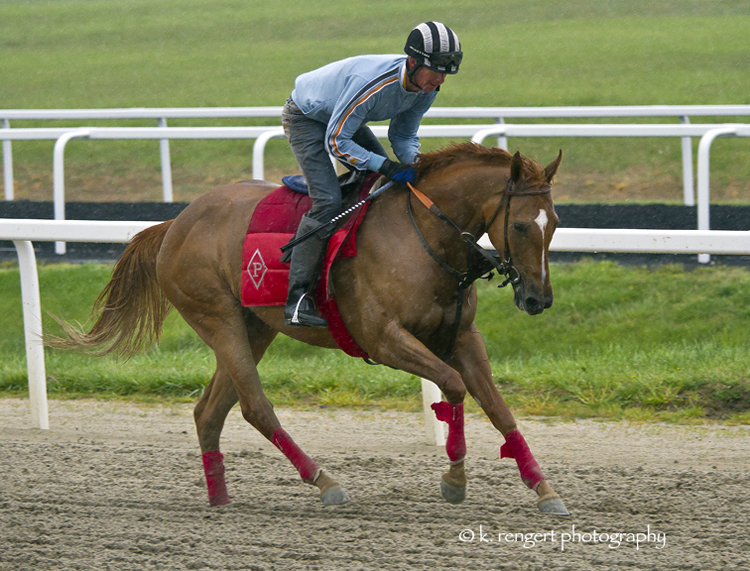 A. P. Indian with Moises Navas aboard breezing at FHTC prior to his first graded stakes win at Belmont on Saturday! Fair Hill had 89 starters last week. There were 12 wins, 18 places, 11 shows and earnings of $1,075,824; 46% of the starters finished first, second or third. There were 7 wins, 13 places, 10 shows and earnings of $388,037; 43% of the starters finished first, second or third. Fair Hill had 72 starters last week. There were 11 wins, 19 places, 8 shows and earnings of $497,842; 53% of the starters finished first, second or third. 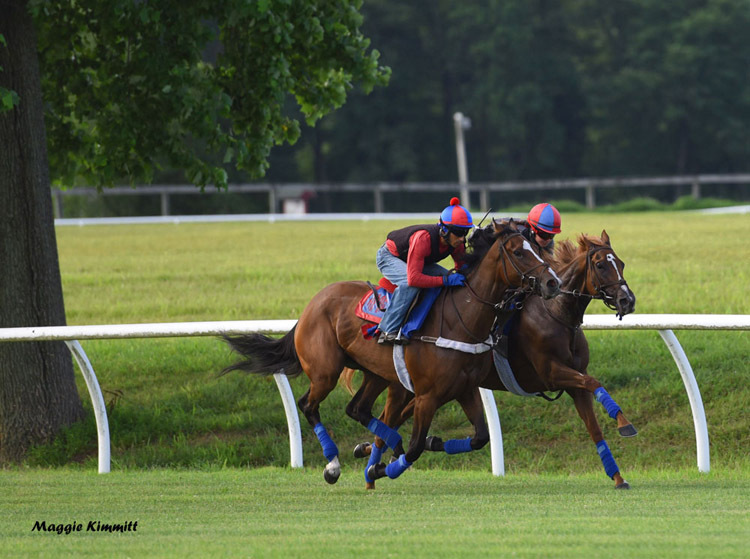 A. P. Indian (outside) with Moises Navas aboard makes breezing look easy at FHTC prior to his stakes win Saturday! 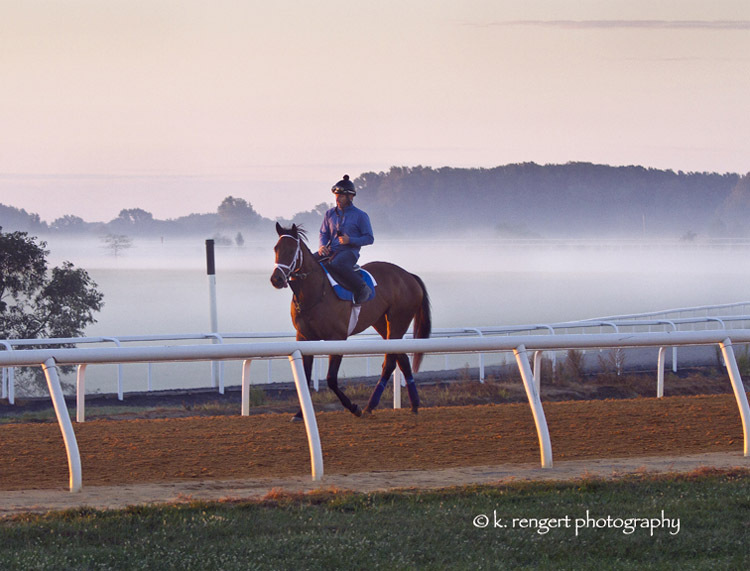 Fair Hill had 58 starters last week. There were 9 wins, 13 places, 10 shows and earnings of $367,518; 55% of the starters finished first, second or third. There were 15 wins, 13 places, 9 shows and earnings of $583,598; 46% of the starters finished first, second or third. There were 16 wins, 8 places, 15 shows and earnings of $558,692; 52% of the starters finished first, second or third. 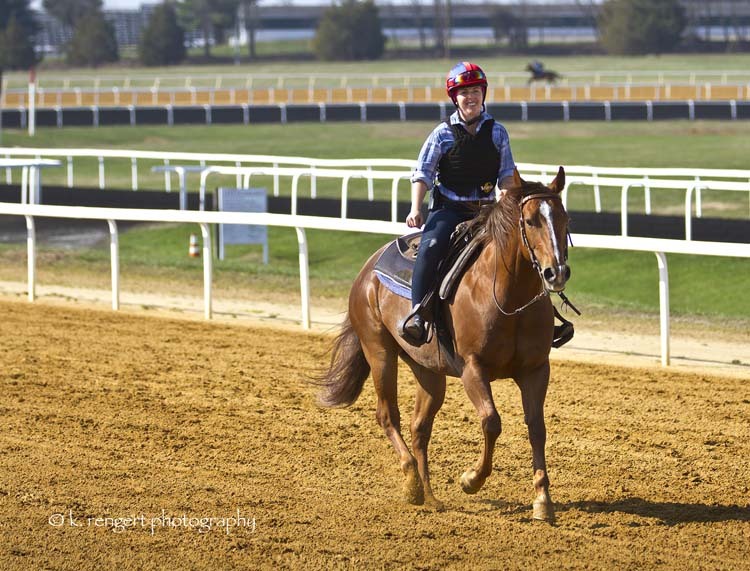 A couple of two year olds first time on the Tapeta – the chestnut was taking a good look at the photographer! There were 5 wins, 9 places, 10 shows and earnings of $276,121; 42% of the starters finished first, second or third. There were 12 wins, 9 places, 9 shows and earnings of $607,622; 44% of the starters finished first, second or third. 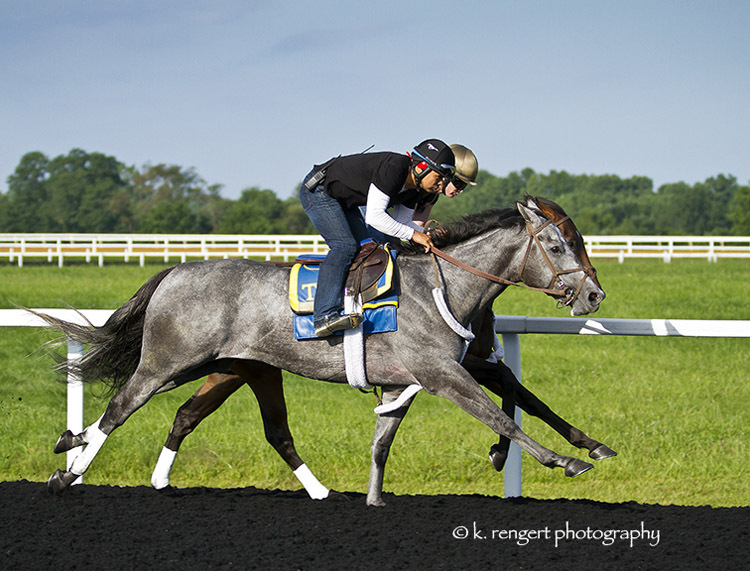 A. P. Indian back at Fair Hill after repeating in the Decathlon Stake at Monmouth Park on Saturday! There were 15 wins, 4 places, 7 shows and earnings of $560,963; 51% of the starters finished first, second or third. 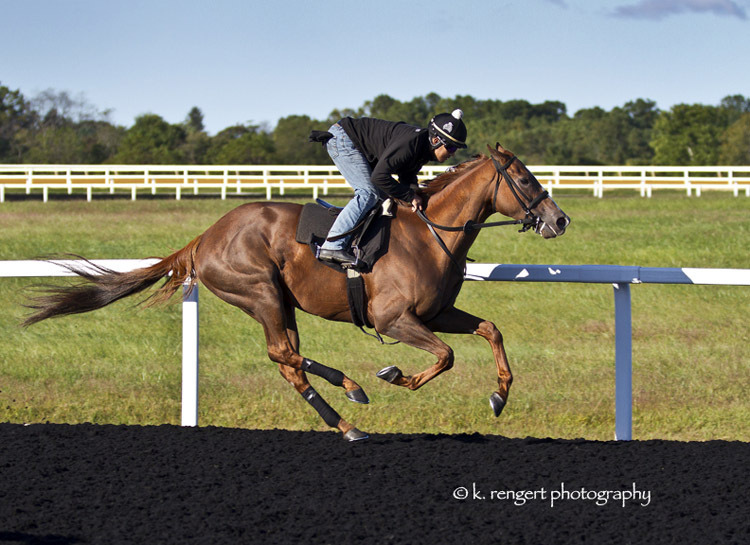 Rum Tum Tugger, Alex Citron aboard, breezing prior to his Secretariat Stake win at Great Meadow on Saturday! There were 4 wins, 6 places, 4 shows and earnings of $252,849; 33% of the starters finished first, second or third. 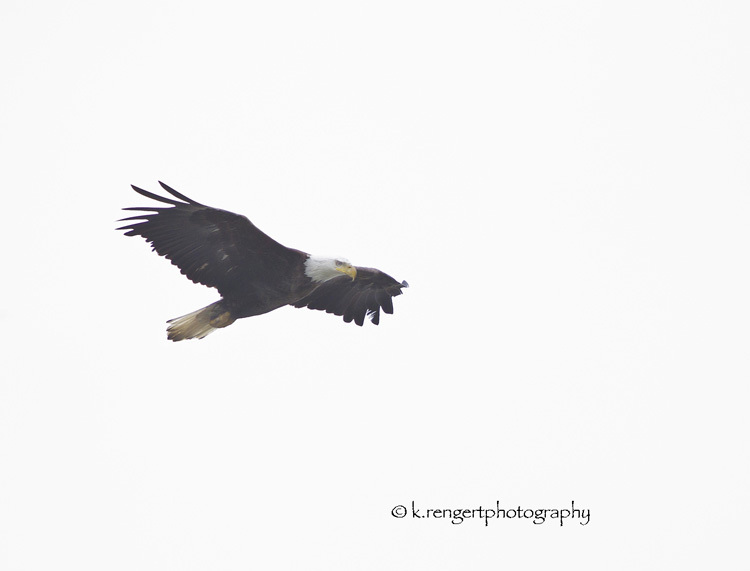 Lots of activity Saturday morning at FHTC…..and down the stretch they come! There were 6 wins, 7 places, 7 shows and earnings of $232,583; 49% of the starters finished first, second or third. Include Betty and Adam Davison caught in the rain on Saturday morning! 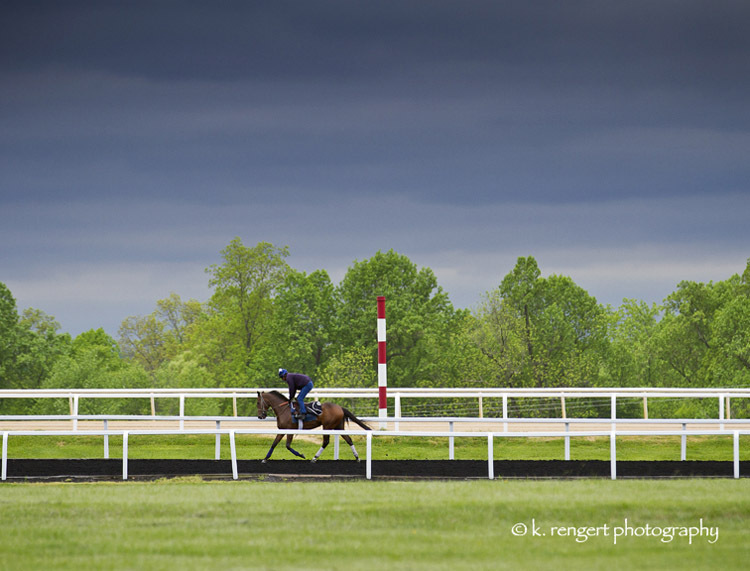 Fair Hill had 40 starters last week. There were 3 wins, 6 places, 5 shows and earnings of $157,441; 35% of the starters finished first, second or third. 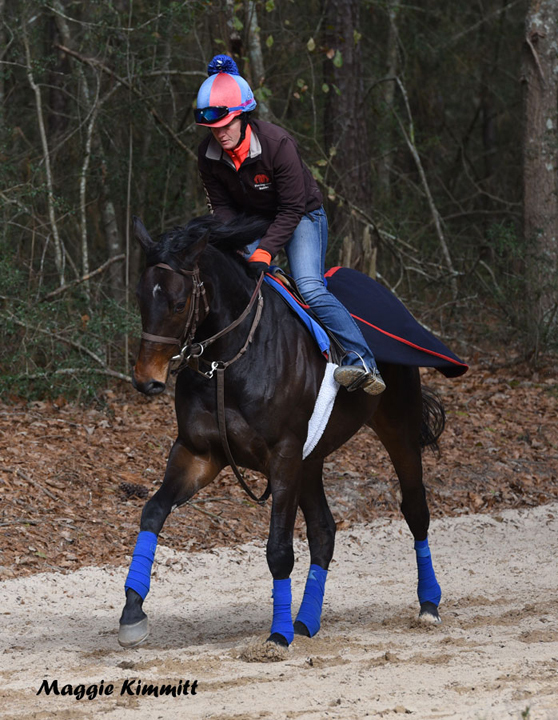 Miss Temple City, Lauren Mendenhall aboard, relishing life in Camden over the winter! 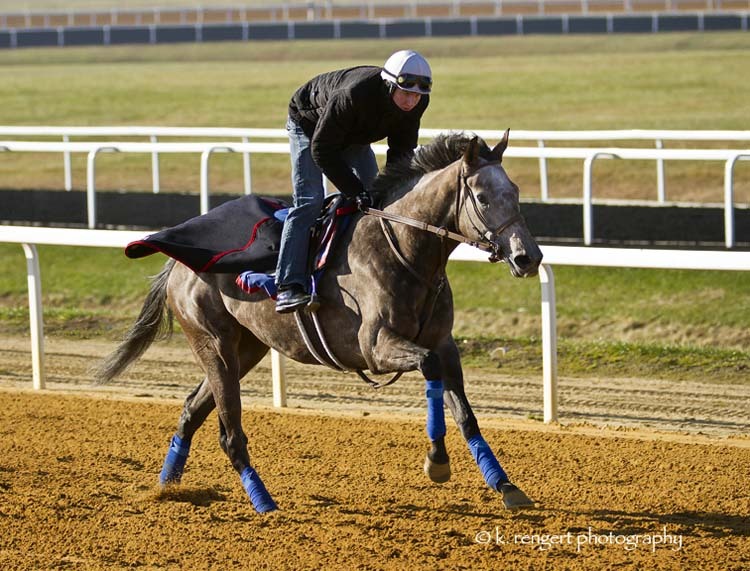 Fair Hill had 43 starters last week. There were 6 wins, 3 places, 6 shows and earnings of $214,650; 35% of the starters finished first, second or third. Pablo Sánchez, recently back from riding in Florida, doing his best to hide from the snow on Saturday! There were 3 wins, 4 places, 3 shows and earnings of $130,823; 36% of the starters finished first, second or third. 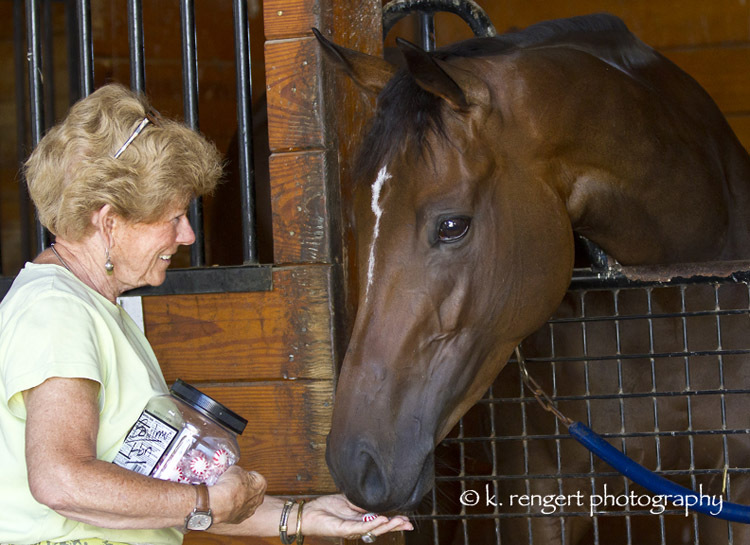 Tony Dutrow's horses back at FHTC as the ramp up to summer training begins! There was 1 win, 5 places, 2 shows and earnings of $75,965; 35% of the starters finished first, second or third. There were 2 wins, 3 places, 1 show and earnings of $77,750; 46% of the starters finished first, second or third. 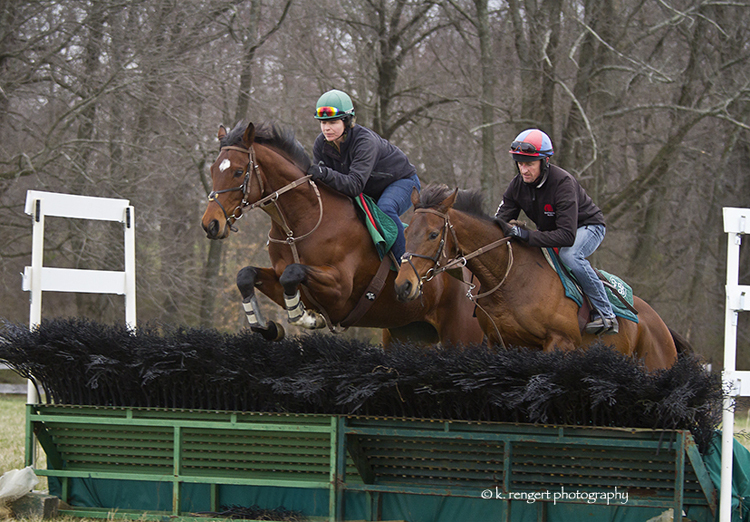 Ex flat horses Glasgow Gailes & Street Passage back on familiar ground at FHTC to prepare for their Steeplechase debuts! There were 3 wins, 6 places, 4 shows and earnings of $132,992; 50% of the starters finished first, second or third. There were 2 wins, 3 places, 3 shows and earnings of $94,750; 38% of the starters finished first, second or third. There were 4 wins, 1 place, 5 shows and earnings of $115,274; 43% of the starters finished first, second or third. 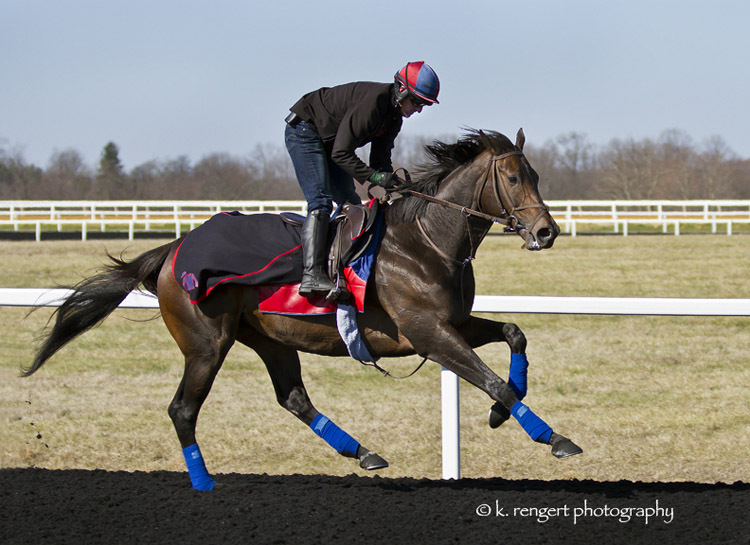 Marengo Road, Elvin Caraballo aboard, training at FHTC prior to winning the Miracle Wood Stake at Laurel on February 15th! There were 1 win, 2 places, 3 shows and earnings of $61,017; 32% of the starters finished first, second or third. There were 2 wins, 2 places, 1 show and earnings of $76,926; 45% of the starters finished first, second or third. There were 6 wins, 2 places, 2 shows and earnings of $134,015; 63% of the starters finished first, second or third. There were 5 wins, 4 places, 3 shows and earnings of $117,462; 43% of the starters finished first, second or third. Drone activity at FHTC tower on Saturday! There were 4 wins, 7 places, 4 shows and earnings of $196,900; 56% of the starters finished first, second or third. There were 1 win, 2 places, 5 shows and earnings of $52,130; 62% of the starters finished first, second or third. There were 4 wins, 9 places, 4 shows and earnings of $160,340; 40% of the starters finished first, second or third. Fair Hill had 25 starters last week. There were 4 wins, 3 places, 4 shows and earnings of $89,767; 44% of the starters finished first, second or third. 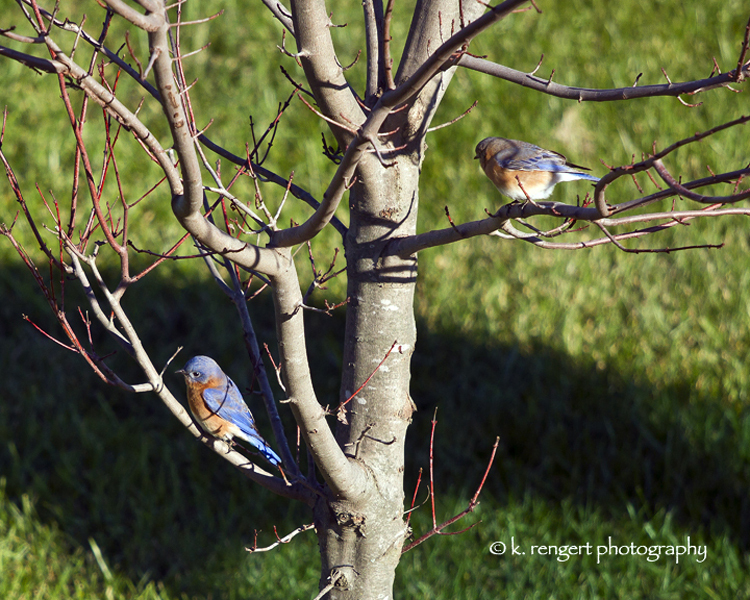 Bluebirds at the tower making spring plans over Christmas – they had to change them this morning! There were 0 wins, 5 places, 4 shows and earnings of $110,014; 28% of the starters finished first, second or third.